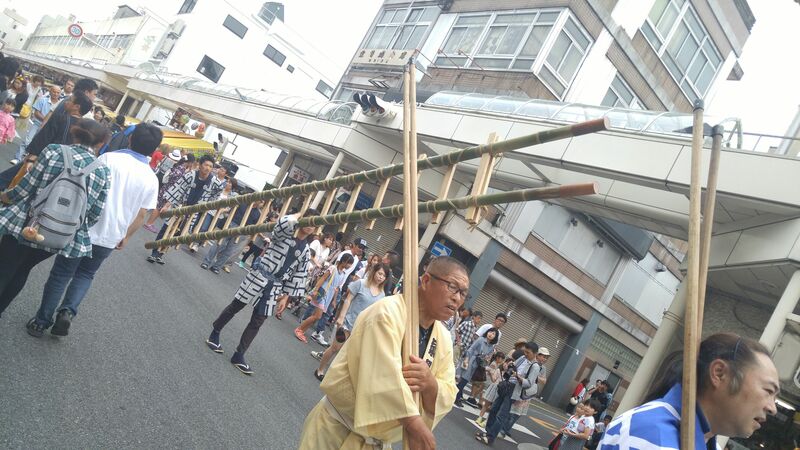 Gion Festival in Yoshiwara, Fuji City (2016) 6): The O-Mikoshi/Portable Shrines! 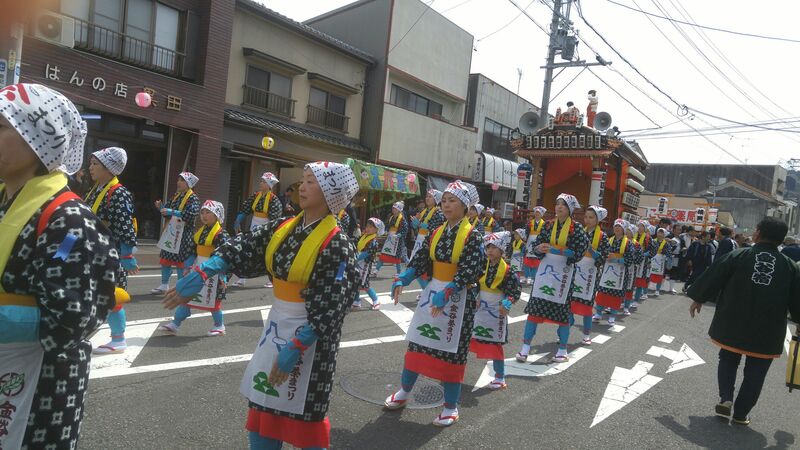 Every year on the second week-end of June a very old Japanese Festival is held in Yoshiwara/吉原 in Fuji City/富士市 called Yoshiwara Gion Festival/吉原祇園祭り. 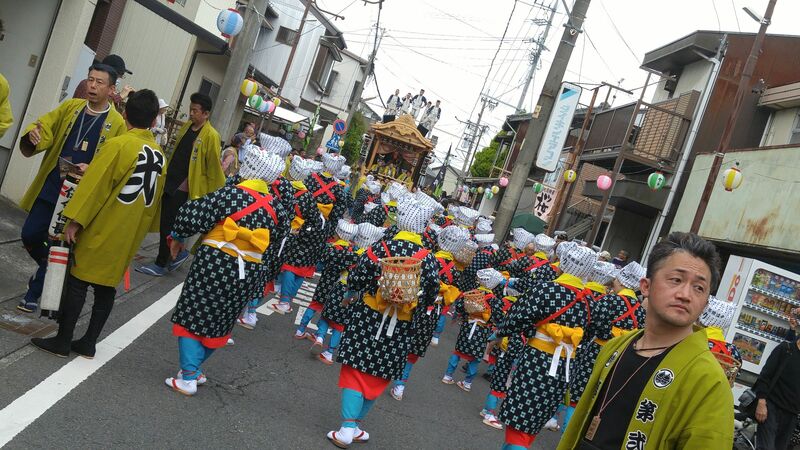 Although it is a well-known festival in Our Prefecture, it seems they welcome more visitors from Tokyo than from Shizuoka City! 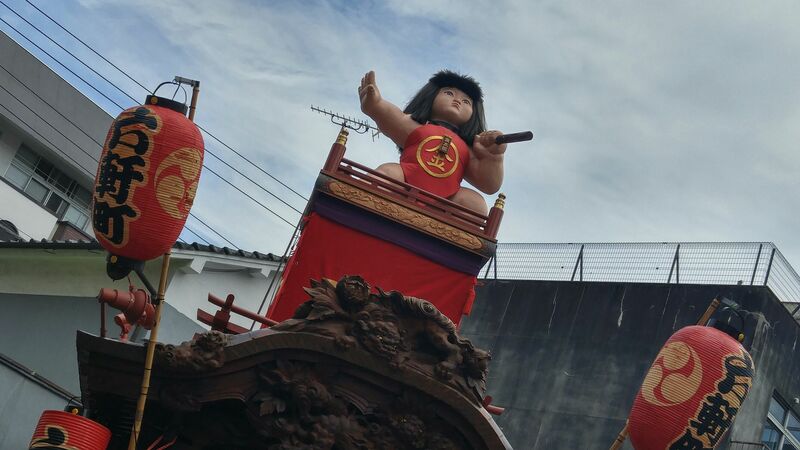 I was able at last to witness it, that is part of it as I had to unfortunately come back early in the evening missing the floats parade. 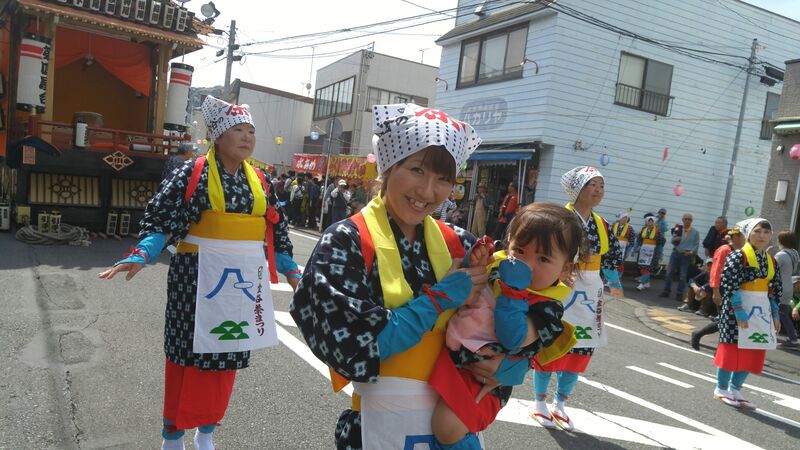 I still manage quite a few pictures to give a good idea of what to enjoy next year! As there are too many photos for a single report I divided them according to their genre or subject. 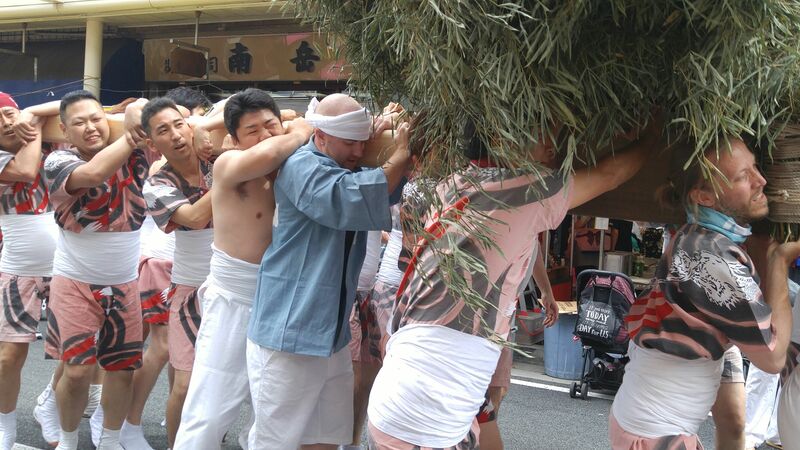 This sixth one is about the O-Mikoshi! 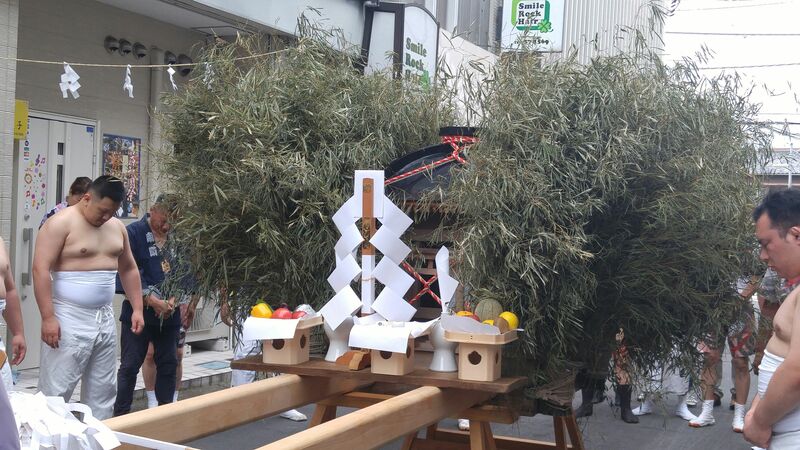 Small O-Mikoshi, probably for children to carry along! 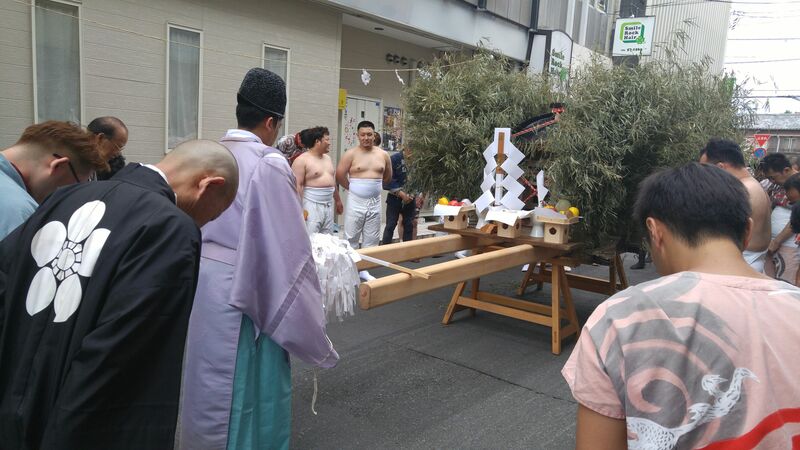 O-Mikoshi/御神輿 is an integral part of Japanese Festivals as the latter are usually related to the Shinto religion. 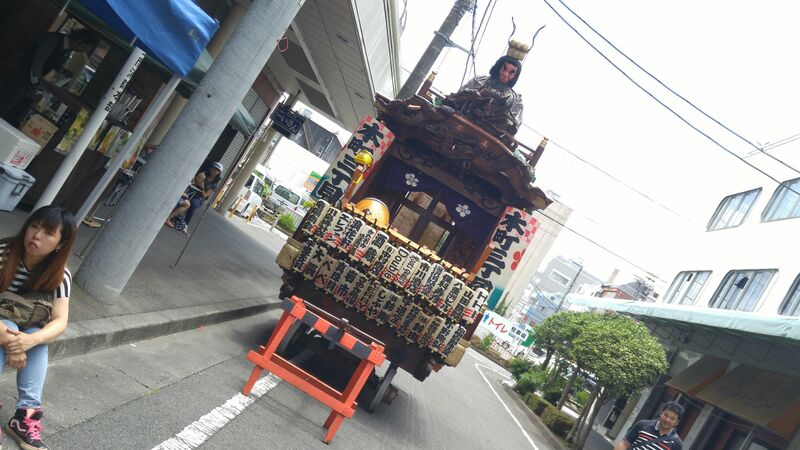 They can be roughly translated as portable shrines and they are usually stored inside Shinto Shrines all year long to be taken out on the day of the Shrine Festivals or on other Festivals. These can be relatively small or near enormous. 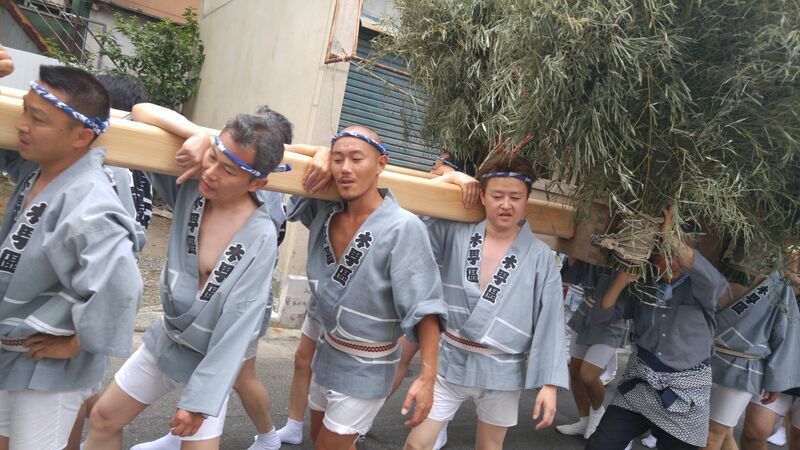 The one used during the Yoshiwara Gion Festival needs at least 20 strong men to carry along the streets of Yoshiwara! 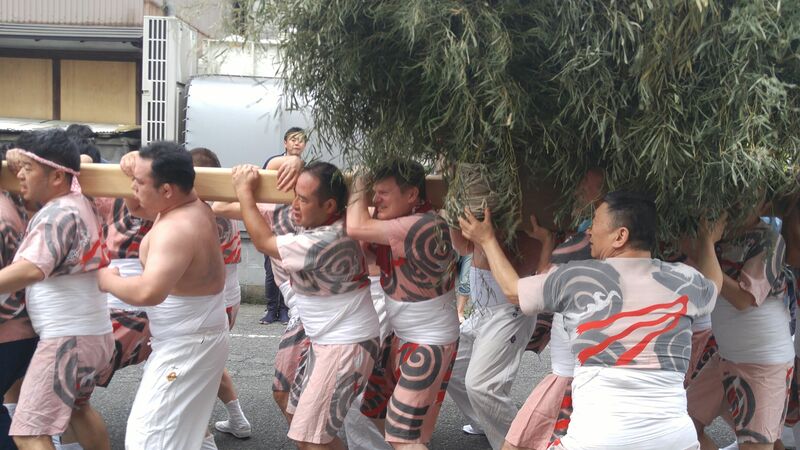 In other Festivals you will sometimes notice ladies helping with carrying, but in Yoshiwara only men are allowed to! 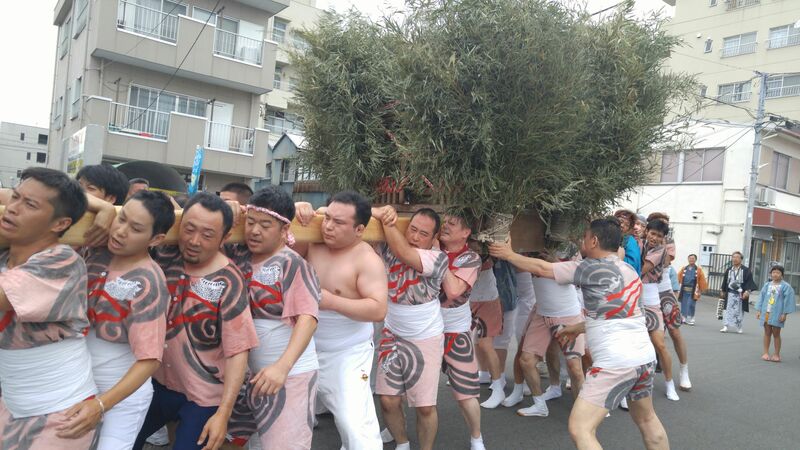 The reason to carry and shake an O-Mikoshi around is to wake up the deity inside and make him/her happy enough to dispense his/her benevolence onto worshipers! 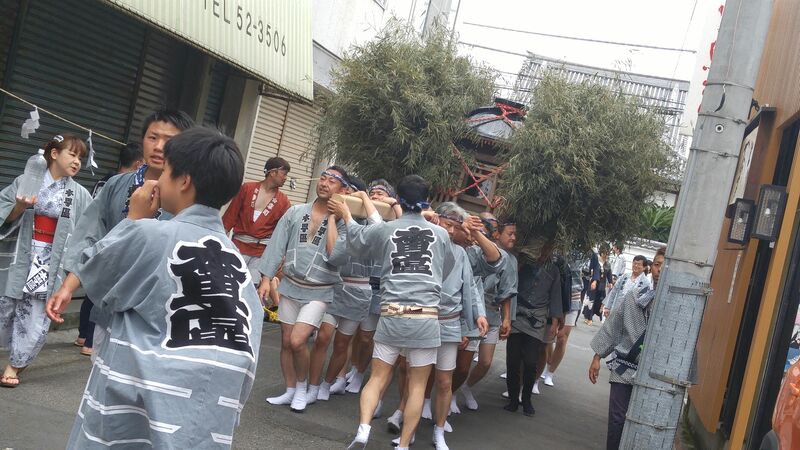 The carrying around of the O-Mikoshi will take all afternoon as all the 21 Districts will take care of it in turns! 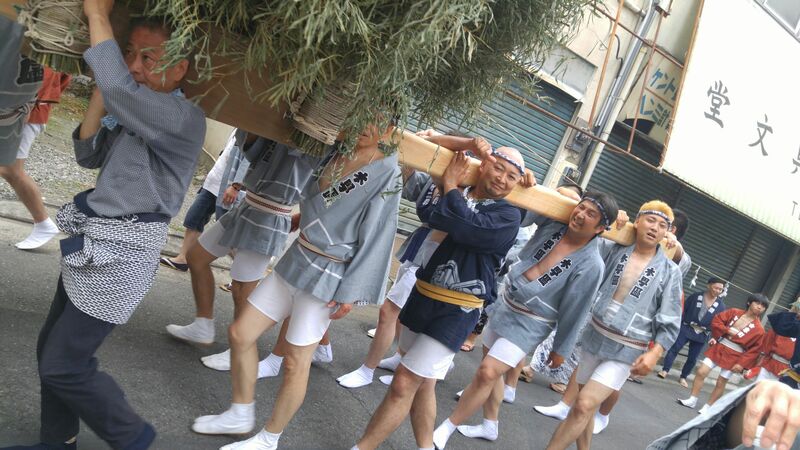 The worshipers bowing in love and respect before carrying their deity around! 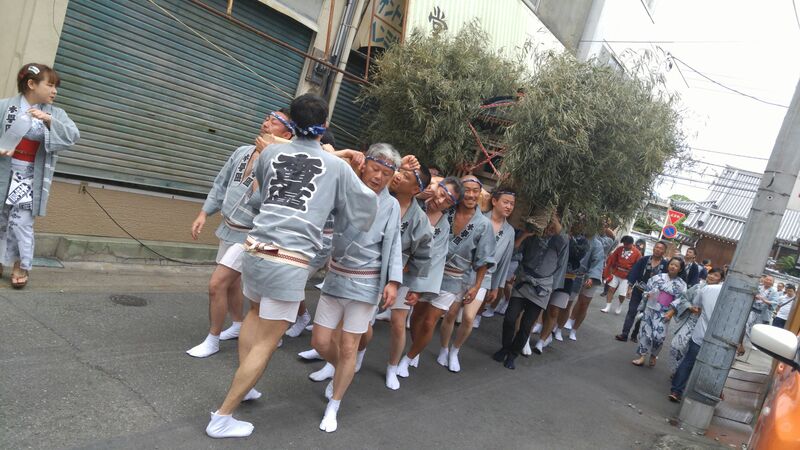 The men may do the carrying but the ladies are always near wit water and sake! Starting to feel the strain! But certainly not giving up! 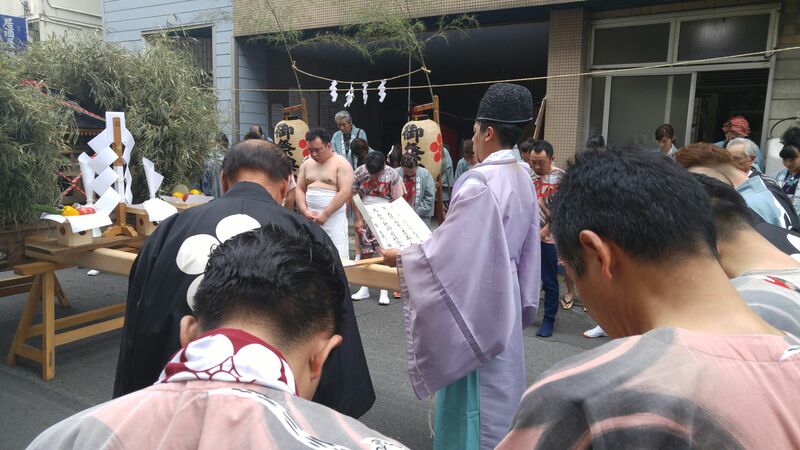 The next District team bow to the O-Mikoshi while the Kannushi/神主/Shinto priest goes through his rituals to bless the portable shrine and his bearers! 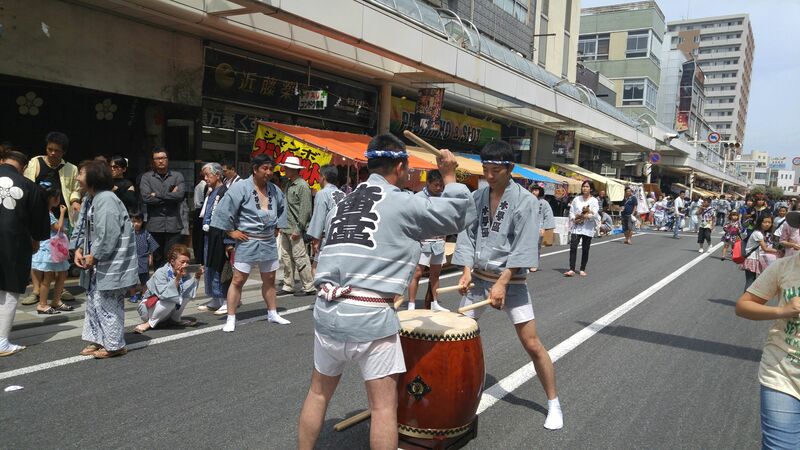 Each district will contribute its own gifts and sake! 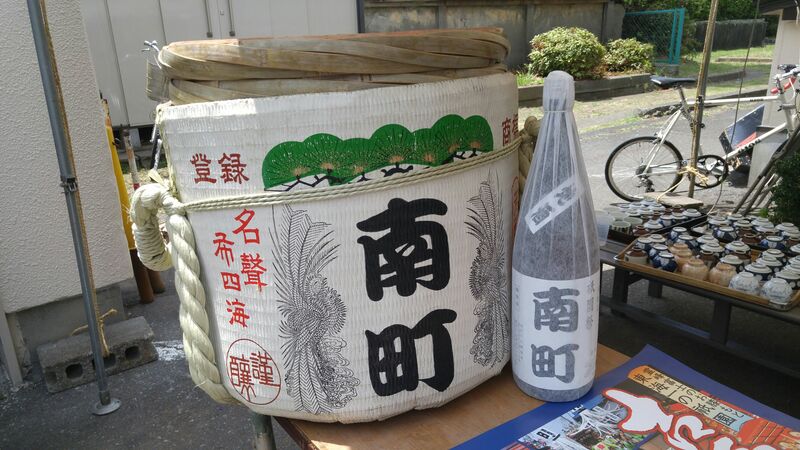 Bear in mind that “sake”‘s original meaning is “Food of the Gods”! 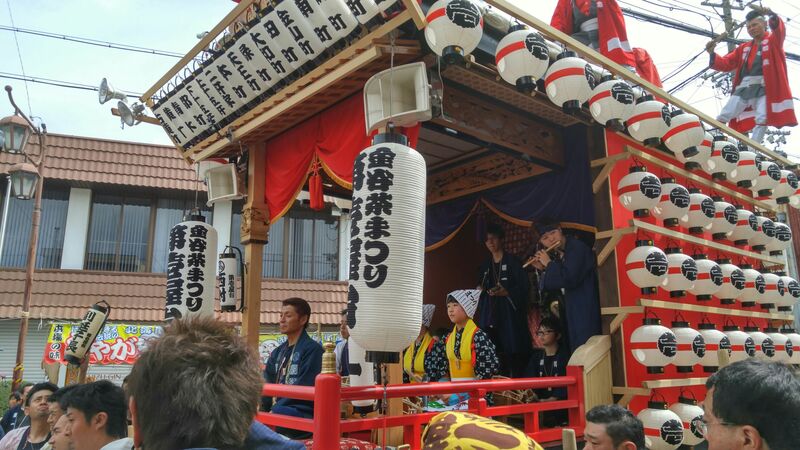 Sake is then poured onto the shrine! 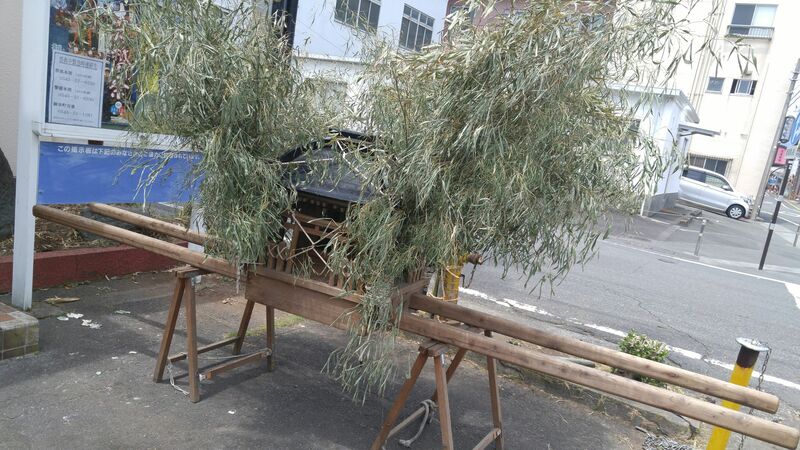 The “sasa/笹/a kind of bamboo tied to the shrine in the Yoshiwara fashion will be taken off branch by branch by the carriers to stay in their home until the next Festival for luck and prosperity! 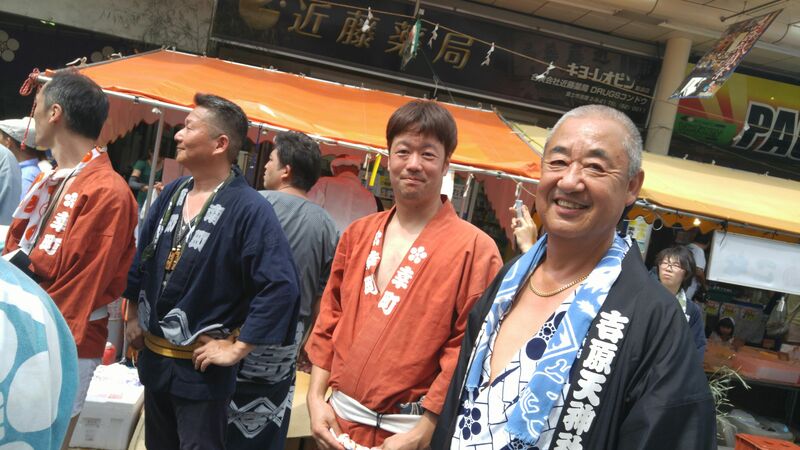 Of late foreigners take part in such festivals and Yoshiwara Gion Festival is no exception. There no less than three of them for this particular district! 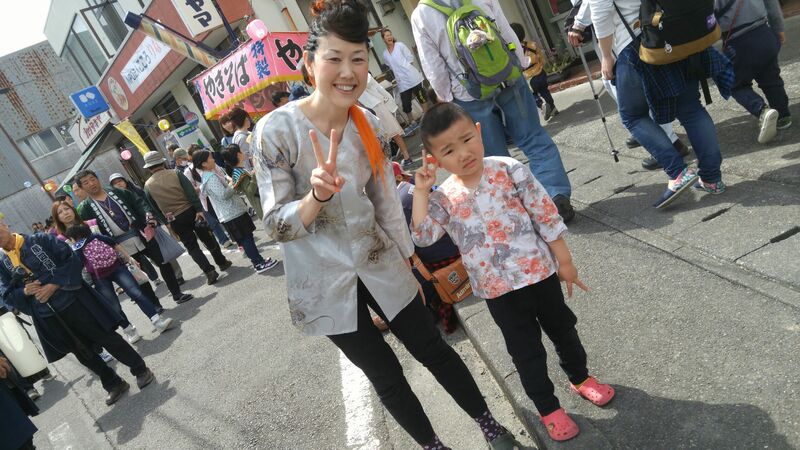 But all the shouting was done in Japanese! 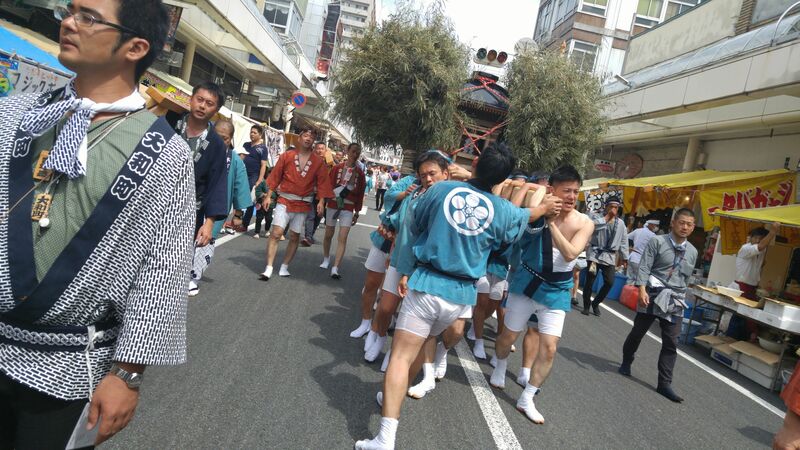 The bare-chested carriers belong to the local judo club. 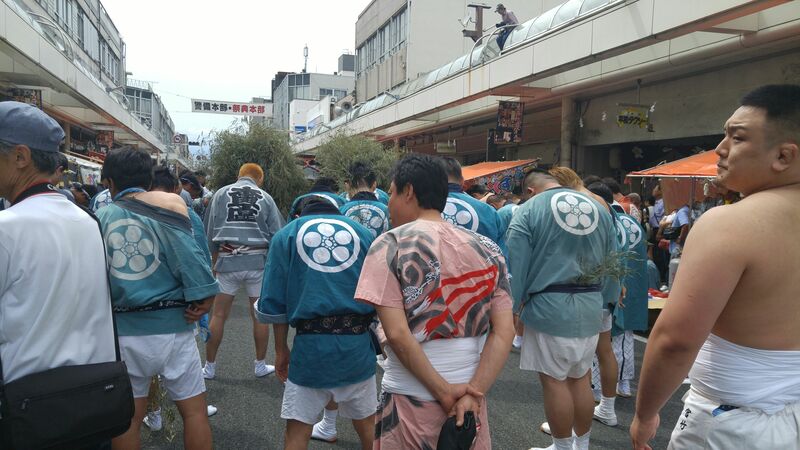 Others wear shirts mimicking the tattoos of bearers of old! 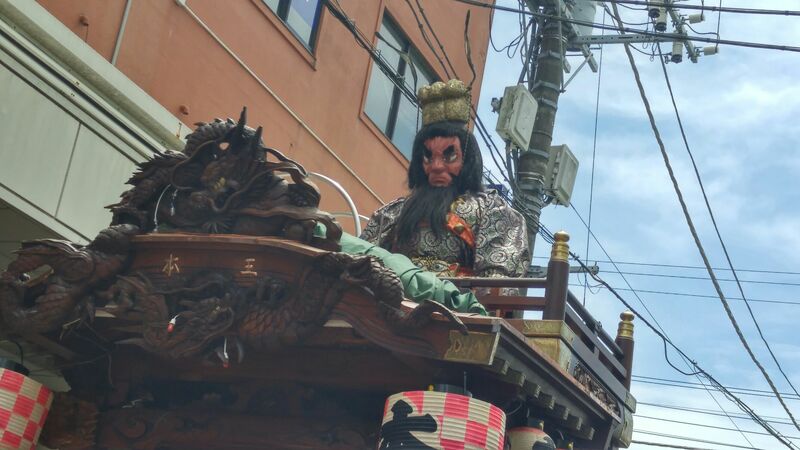 Gion Festival in Yoshiwara, Fuji City (2016) 5): The Floats! 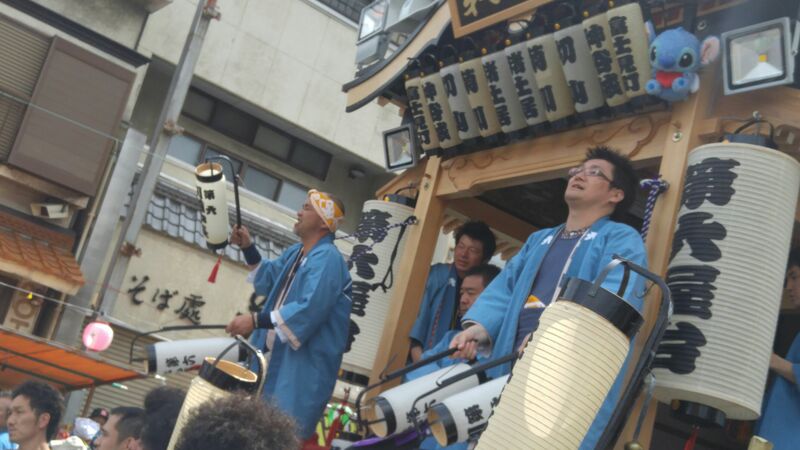 This fifth one is about the floats! 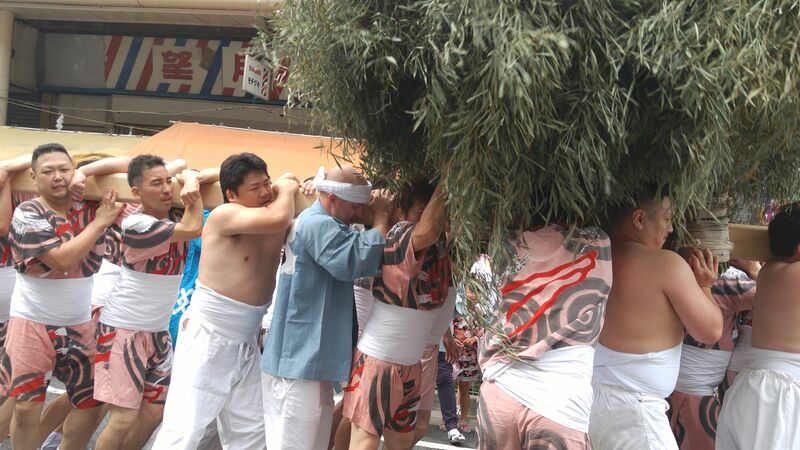 It was a bit unfortunate I had to leave before the festival floats were due to go out on the streets just before the night set with all the lanterns alight and drummers and revelers riding them. Well, that will be my goal next year! At least I walked around to gather some information. 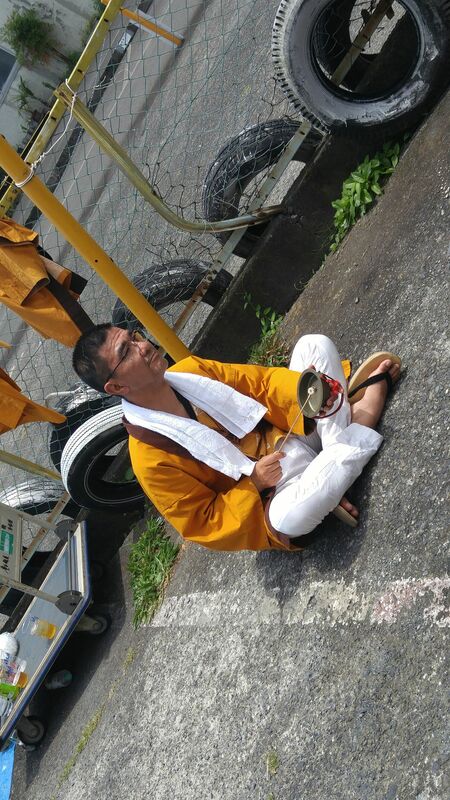 My steps brought me into the Minami/South District where one of them was standing in its hangar. 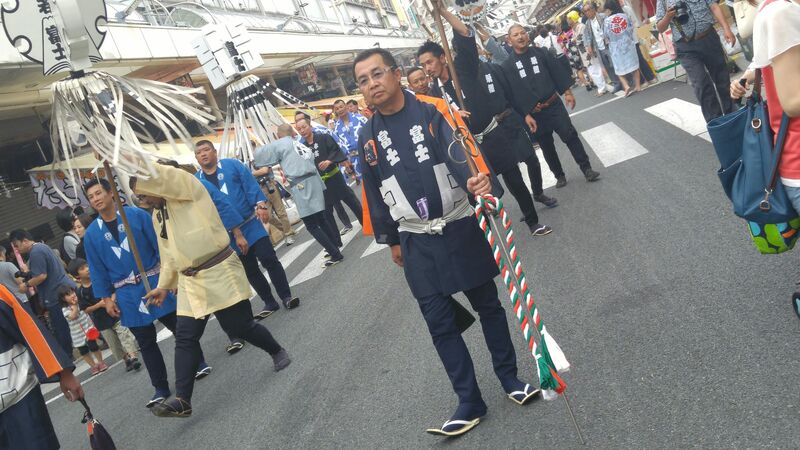 I noticed the sake barrel and bottle and I was told that each of the 21 districts parading its float had its own barrel and bottles markd with the name of their district. All sake is honjozo brewed by Makino Brewery in Fujinomiya City (there hasn’t been a sake brewery in the City of Fuji for quite a long time!). 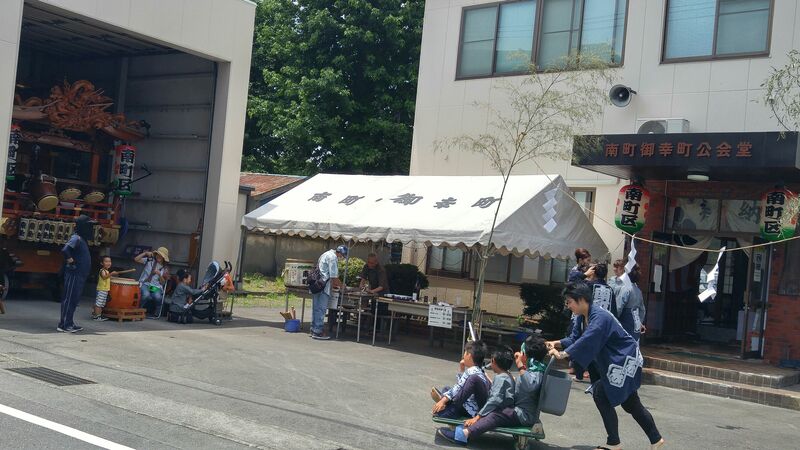 The Minami District float inside its shelter/hangar! 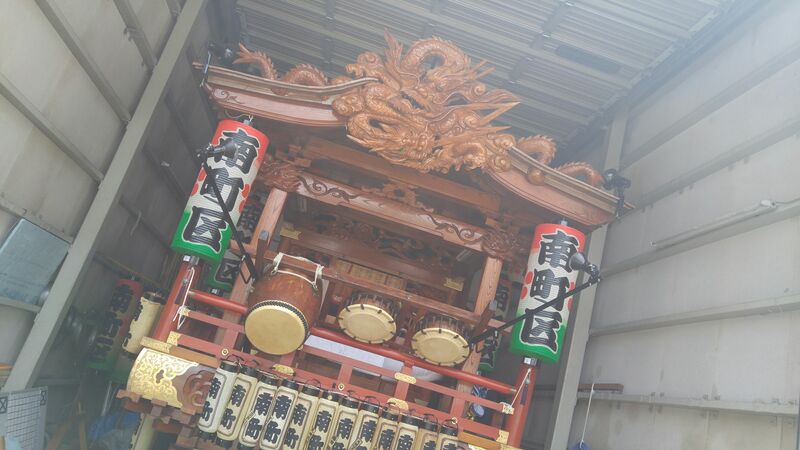 The float from the Moku District San Chome! What is that fierce deity? 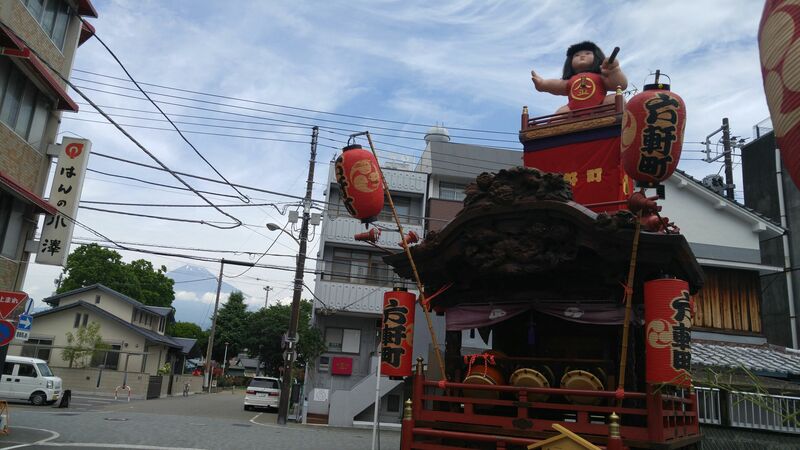 The float from the Rokken District! 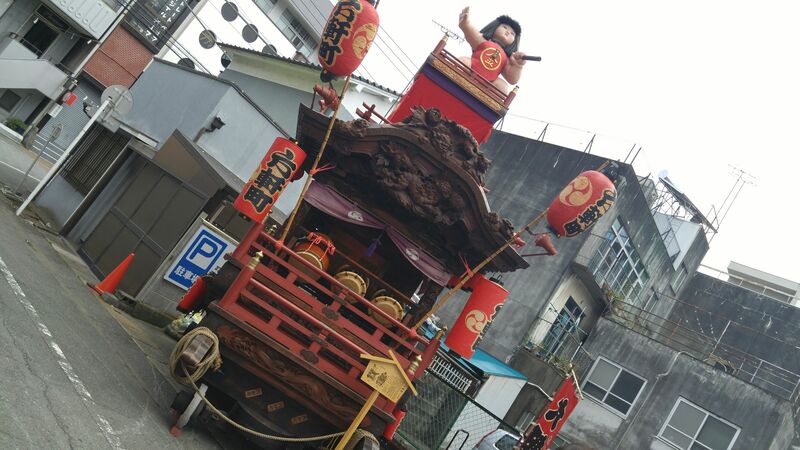 Next year I will concentrate on these floats at night! 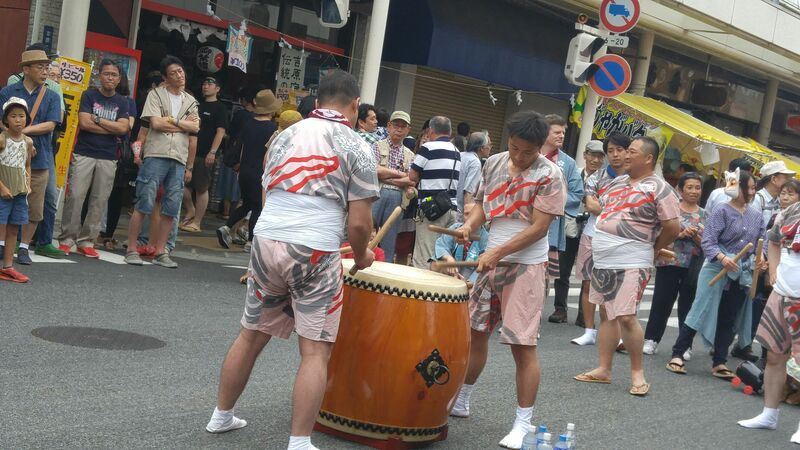 Gion Festival in Yoshiwara, Fuji City (2016) ４): The Drummers! 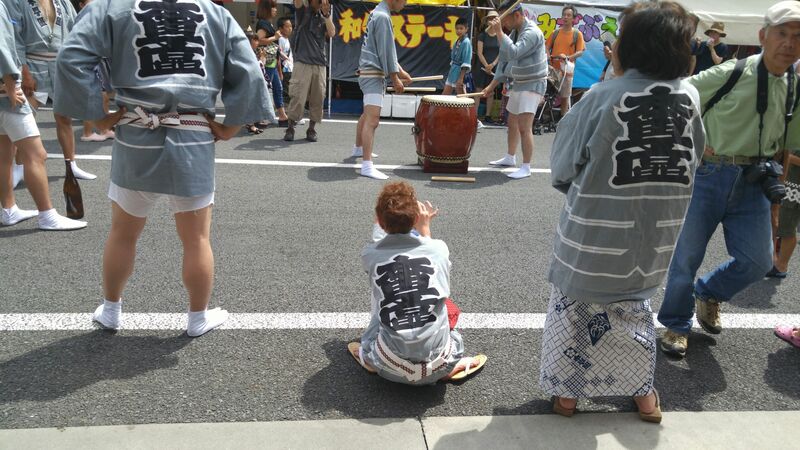 This fourth one is about the drummers! 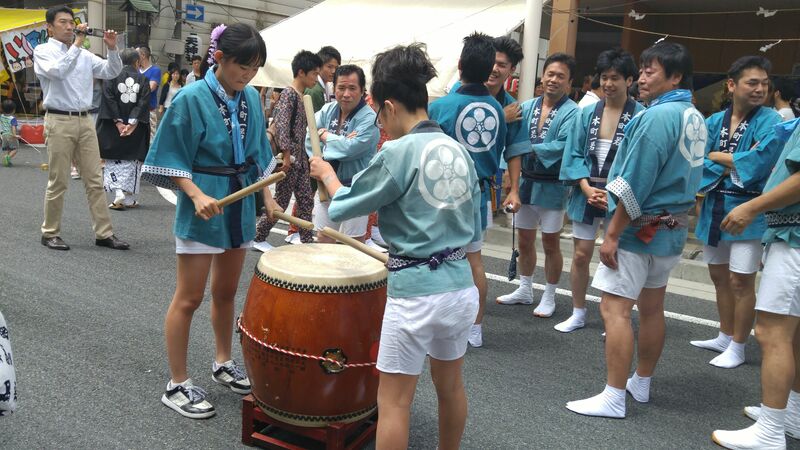 Drummers are part and parcel of any Japanese Festival as they help wake up the Gods! It is always a good subject for photography! As in any other place it is also a good idea to first wander around places far from the “real action” where you can discover really dedicated locals! 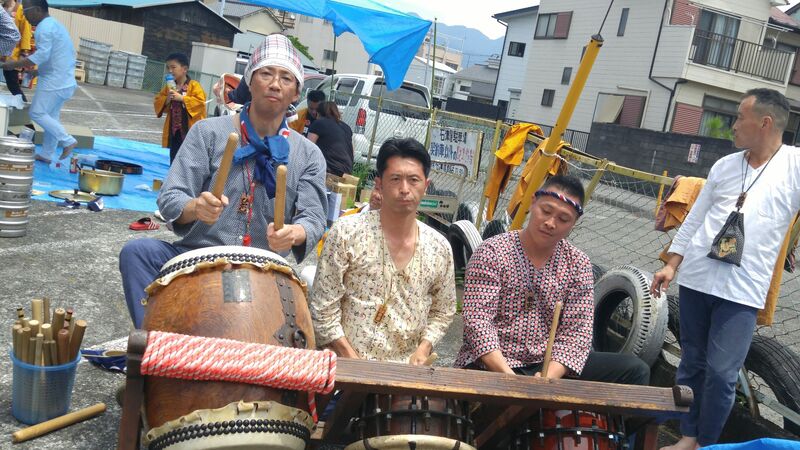 Naturally other forms of percussion can be discovered! 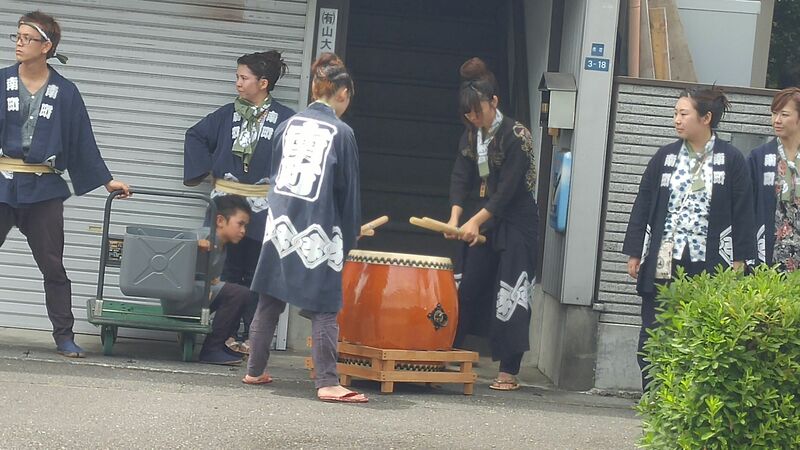 In Fuji City there are enough men to take care of the drums but some tough ladies can also be found! 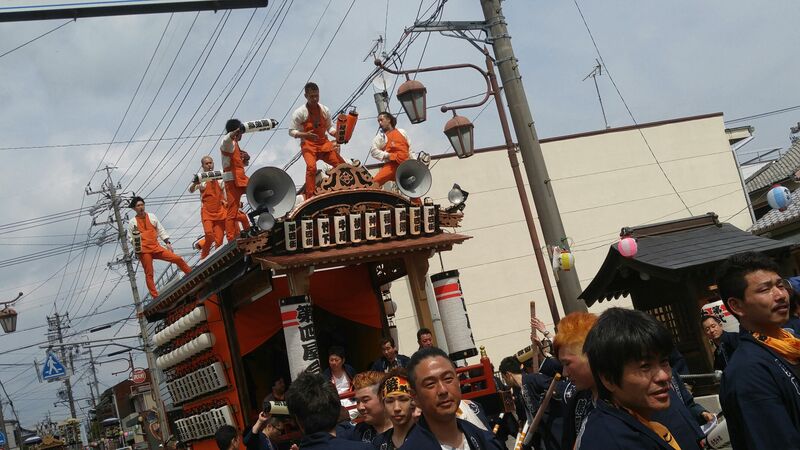 The drumming usually is featured before the o-mikoshi/portable shines procession to warn all revelers beforehand! 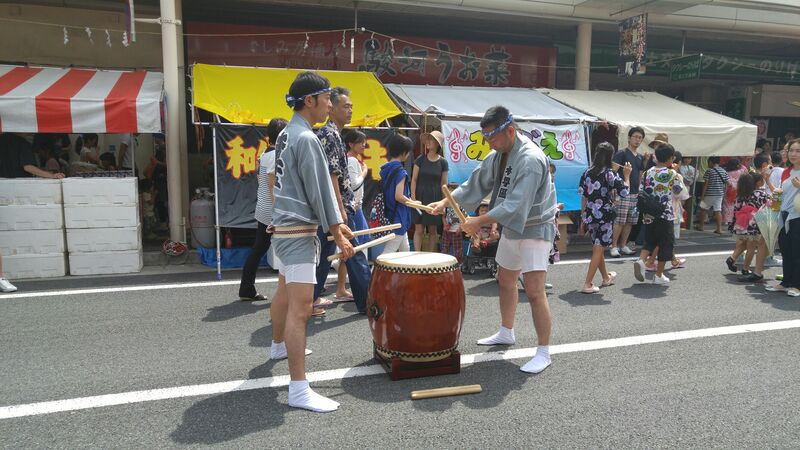 it is an occasion for youngsters to try their hands! The representatives of a different district! A good time for ladies to take pictures of their “Men”! Different teams keep relaying each other! 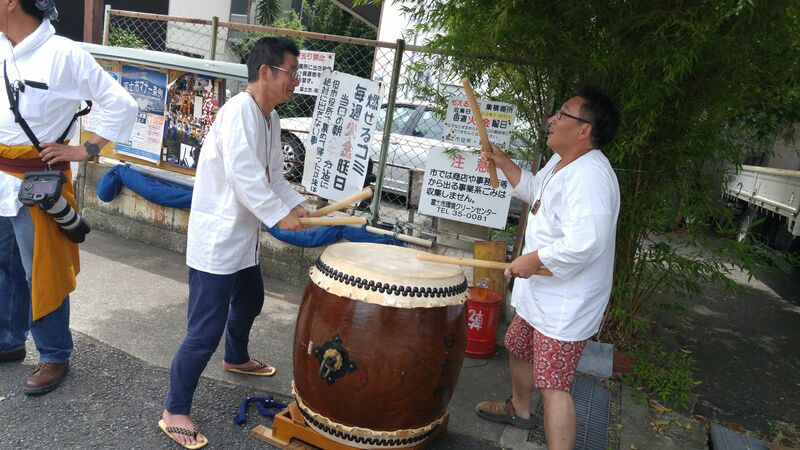 Actually more and more expat residents participate to the drumming at many other venues! 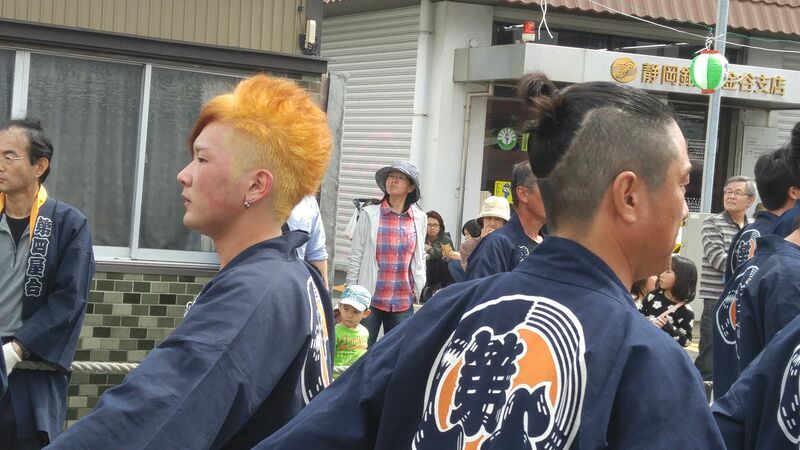 Gion Festival in Yoshiwara, Fuji City (2016) 3): The “Faces”! This third one is about the “Faces”! 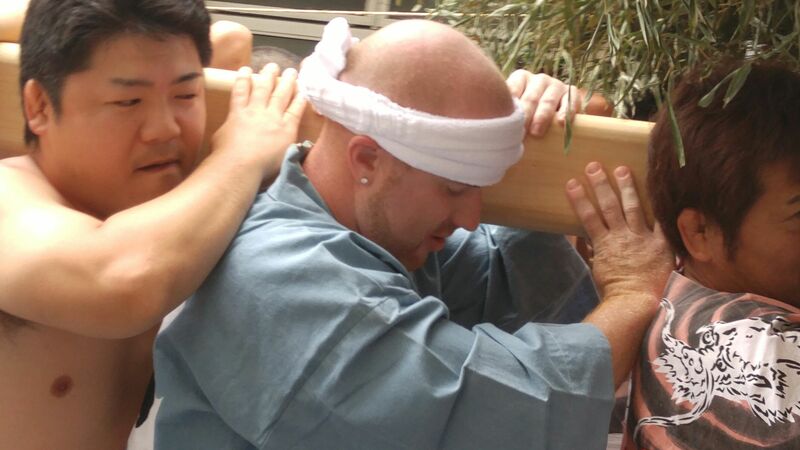 Hefty members of the local judo community! 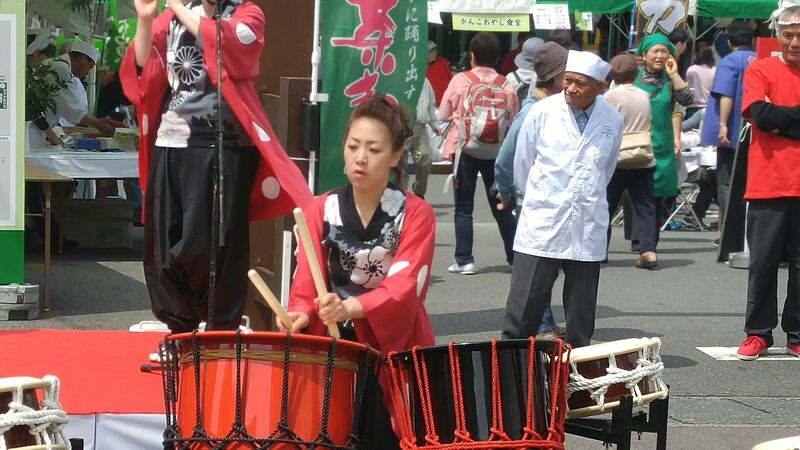 When you attend a typical Japanese festival it s always a good idea to take photographs working on the theme of the participants’ faces. 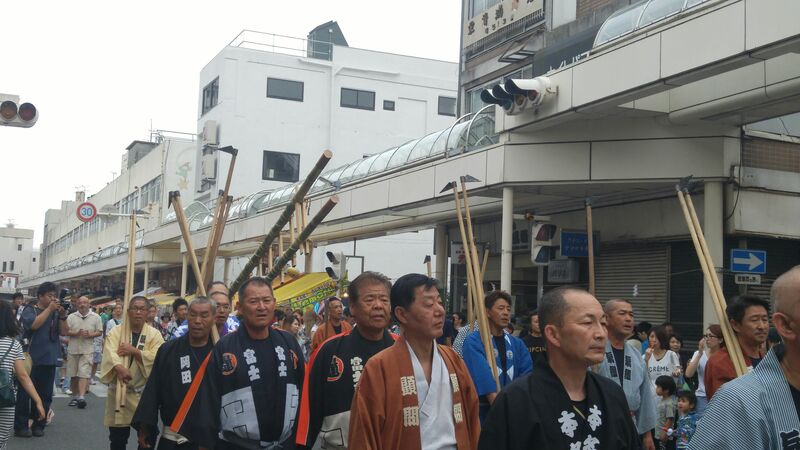 40 years or more ago that could have been a bit difficult as disreputable members of the Japanese society were more or less in control of such events, but nowadays Japan is so peaceful and bereft of sinister members that it has to actually mimic the latter whereas traditions are kept intact! 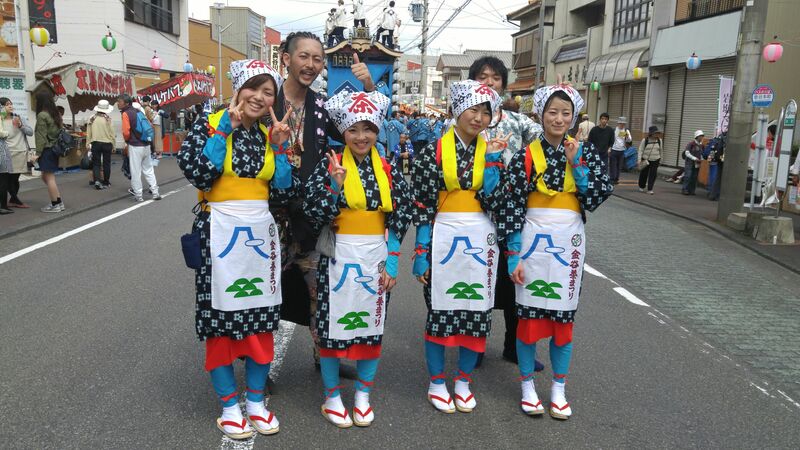 Some of the senior members of the Festival! I did ask them politely to look fierce but they just couldn’t help smiling at the notion! 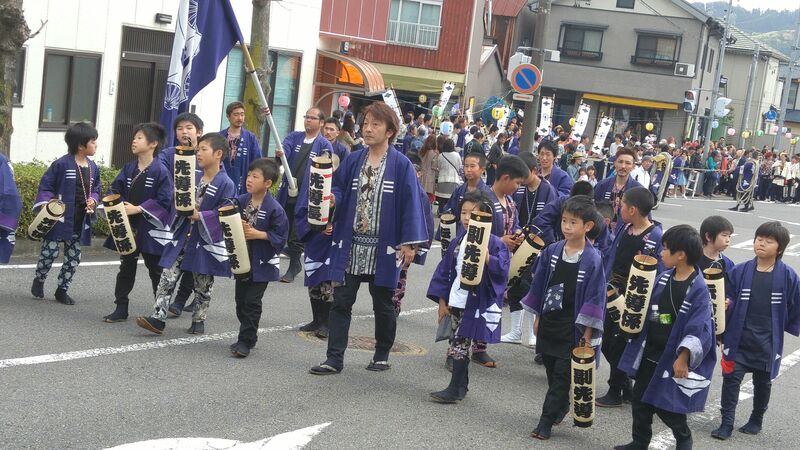 Mind you, this is Shizuoka Prefecture, one of the most peaceful regions of the Japanese Archipelago! 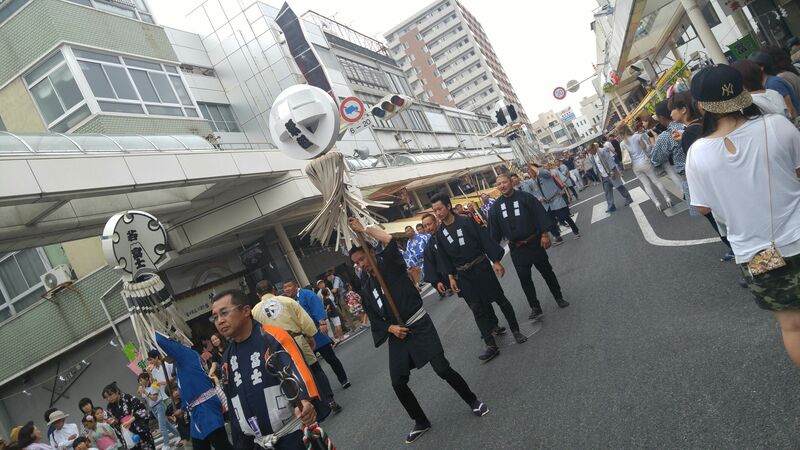 Osaka and Kyushu Island denizens do look fierce there without being asked! 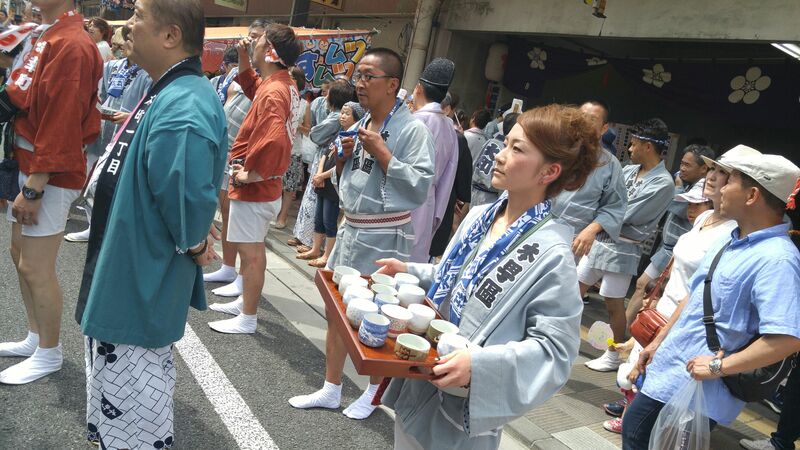 A local lady ready to serve sake to the participants, especially the o-mikoshi/御神輿/portable shrine bearers! 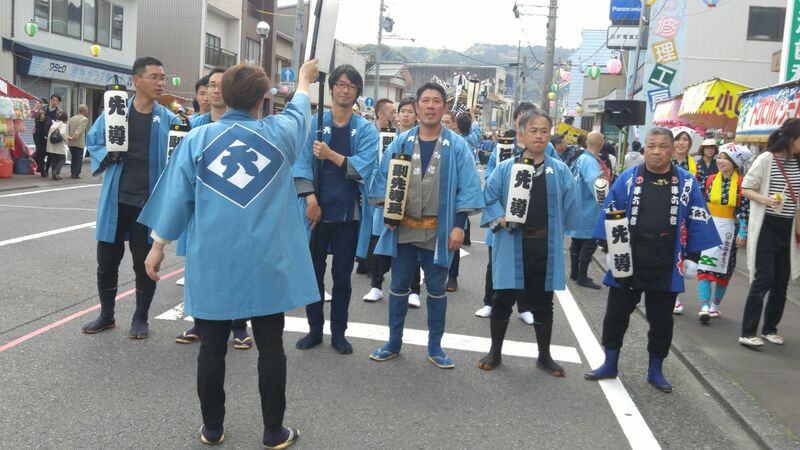 I found out that each district had its own bottles of sake designed with a different label by Makino Brewery in Fujinomiya City! 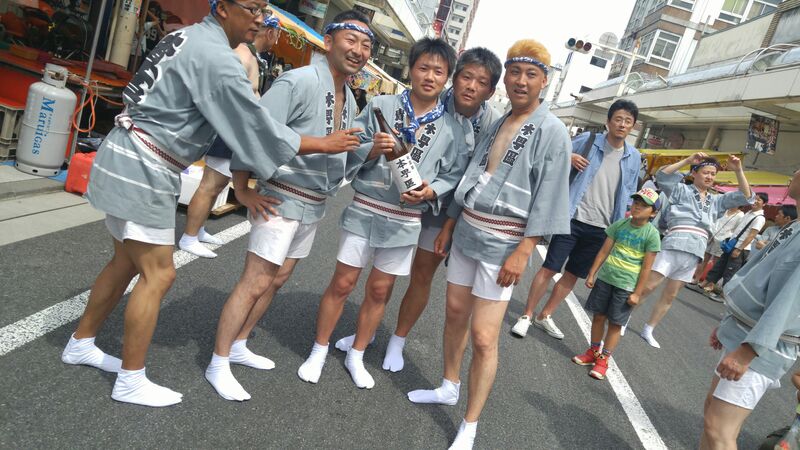 These gentle-looking portable shrine bearers gracefully agreed to pose with their bottle of sake! 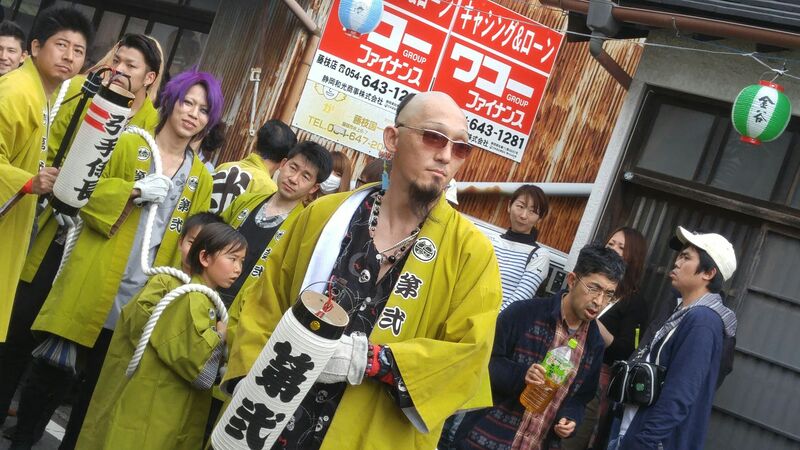 You do not see tattoo-exhibiting revelers any more and the body decorations have to be represented by special garments! Actually the police these days would automatically apprehend or at least ask questions to people exhibiting tattoos in a provocative manner. 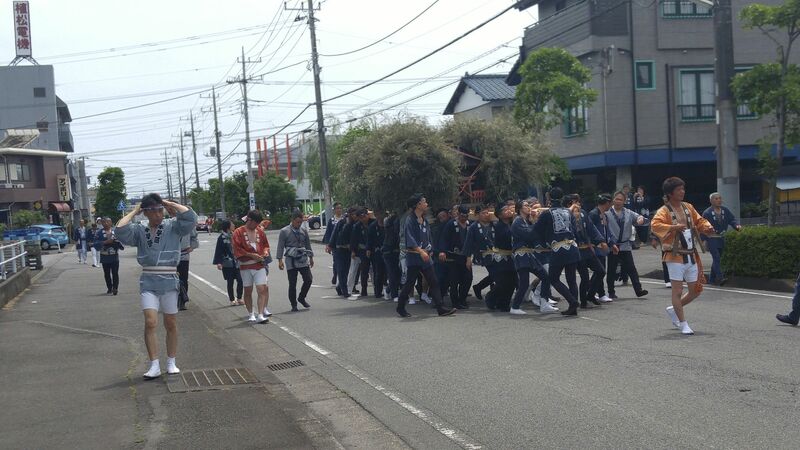 Well, at least in Shizuoka Prefecture, following the demise of large underworld groups based in Fujinomiya City and Atami City! But be somewhat careful in other regions! 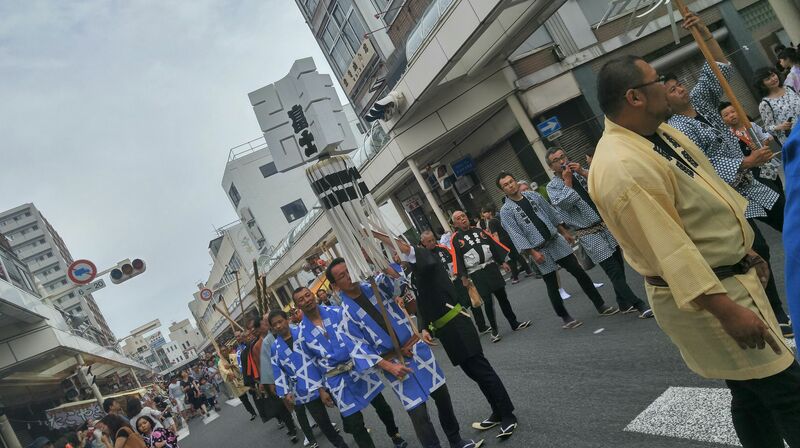 Gion Festival in Yoshiwara, Fuji City (2016) 2): Fire Brigade Parade! 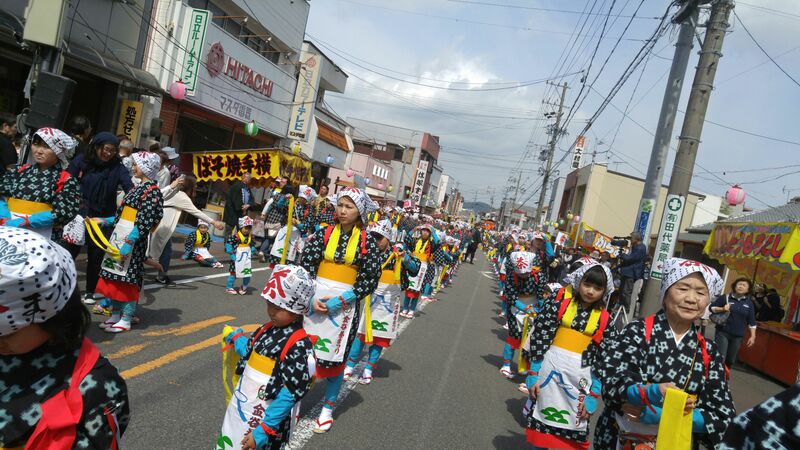 This second one is about the traditional Fire Brigade Parade! 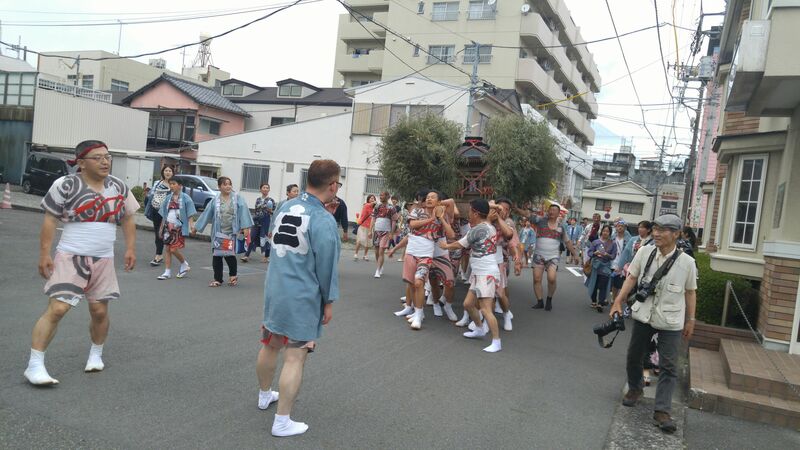 Firemen with hapi/festival coat emblazoned with “鮫/same/shark” as they represent a district callled “Samejima/Sharks Island” related with the fishing of sharks! 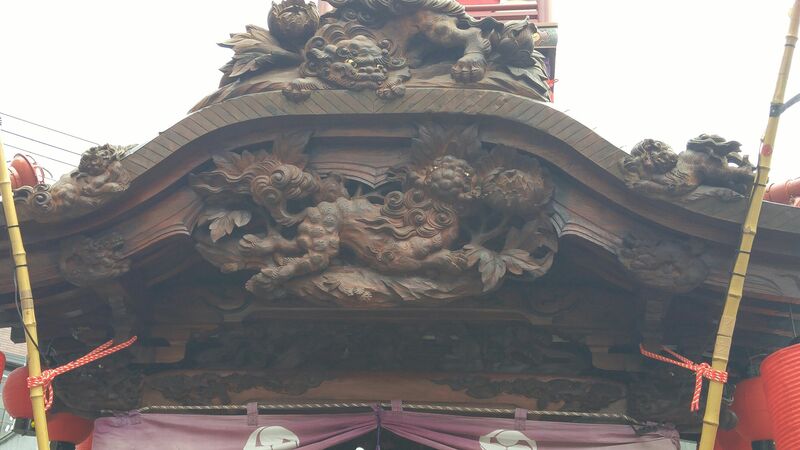 Fires being the scourge of old Japan, firemen were probably the most respected society group in those times, even more than any security or soldiering forces. 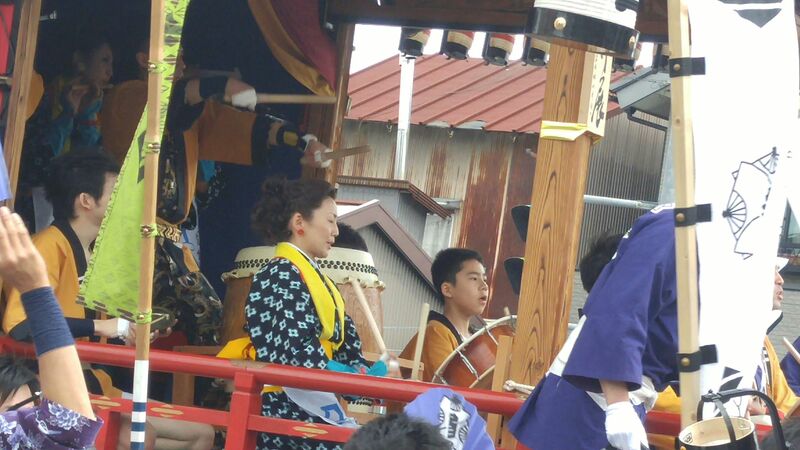 Most of them were more or less volunteer but they certainly had their say in the feudal Japanese society! 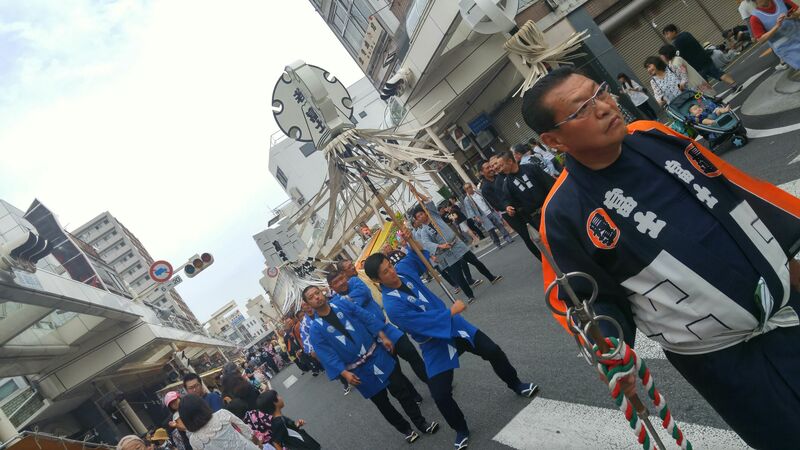 The parade is led by two stern looking “officials” holding special metal stick they bang on the ground as they proceed forward! 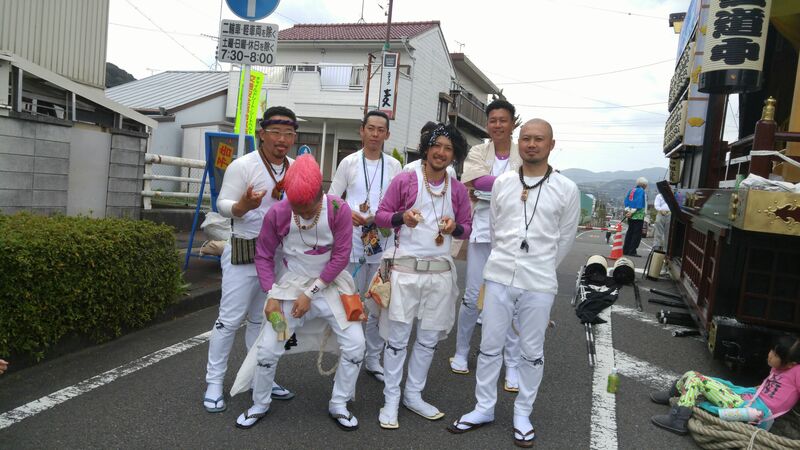 Interestingly enough they represent the whole of Fuji City! I suspect those two officials are real fire brigade officers! 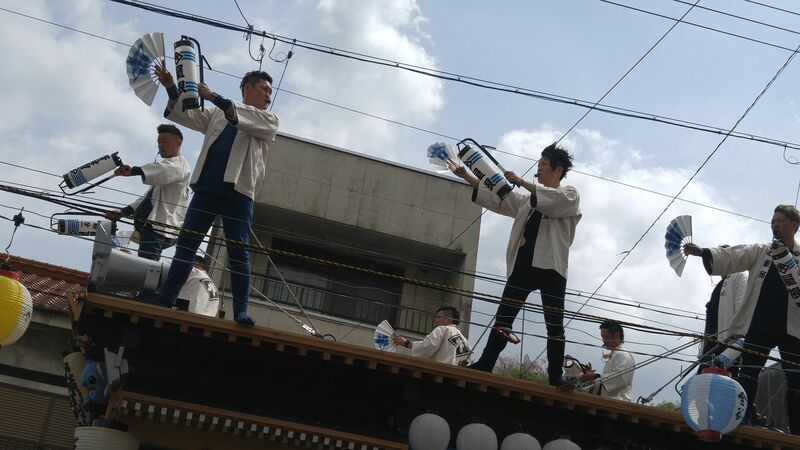 Although there are plenty of professional firemen in Japan, their work is helped by many volunteers! 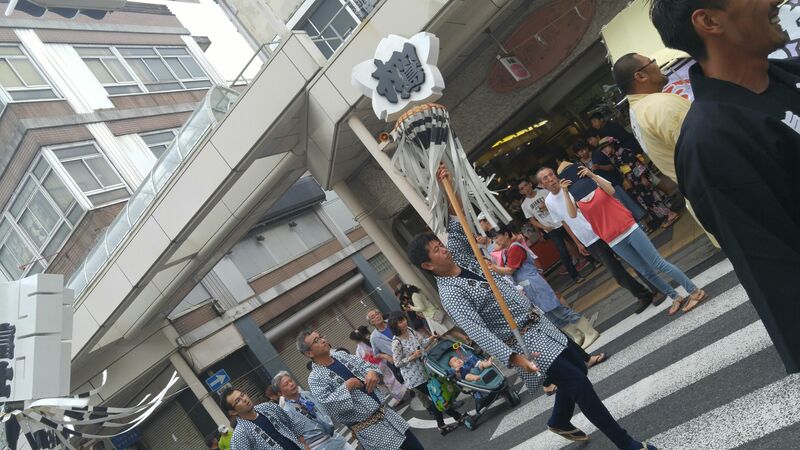 Each main secondary/district fire brigade is represented by a pole holder who agitates the “matoi/纏” as it is called up and down and in circles! 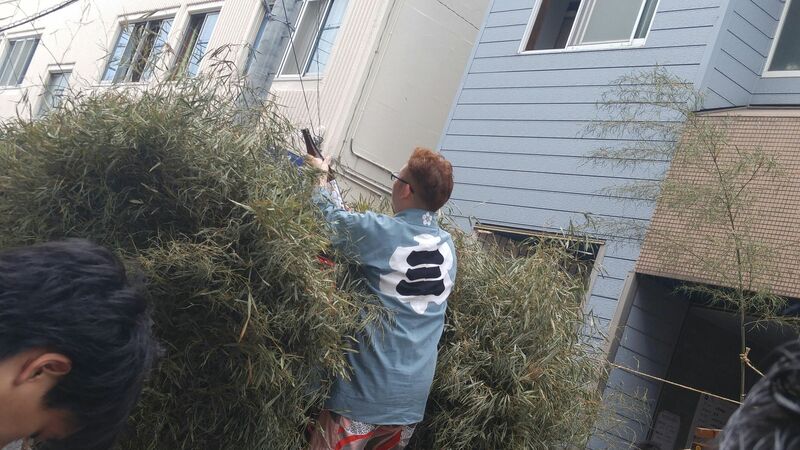 Hard work which has to be regularly relayed! 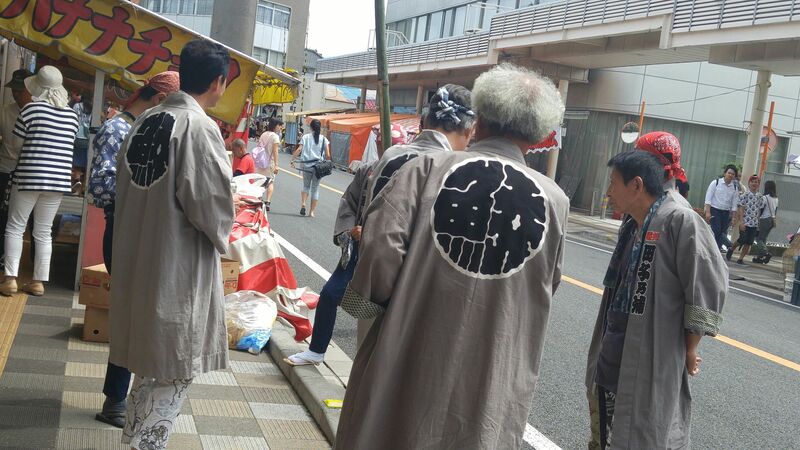 This particular matoi represents the whole city of Fuji! 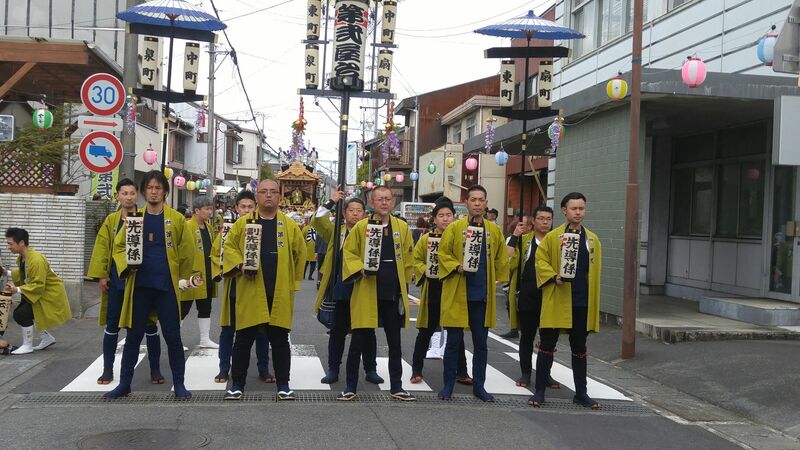 in spite of the festive occasion participants are all very serious about it! 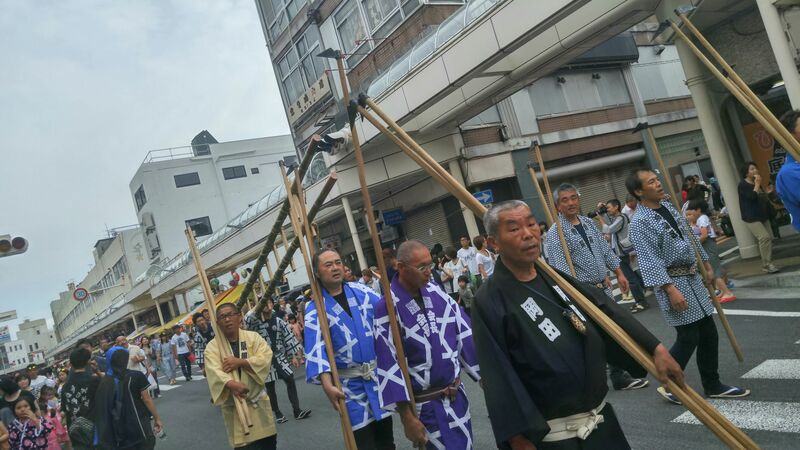 Now, these men carry scythes mounted on long poles. At the time carrying water to a fire site would have taken too long, so the houses on fire were pulled down as soon as possible. Neighboring houses would suffer the same fate as to create a fire void! 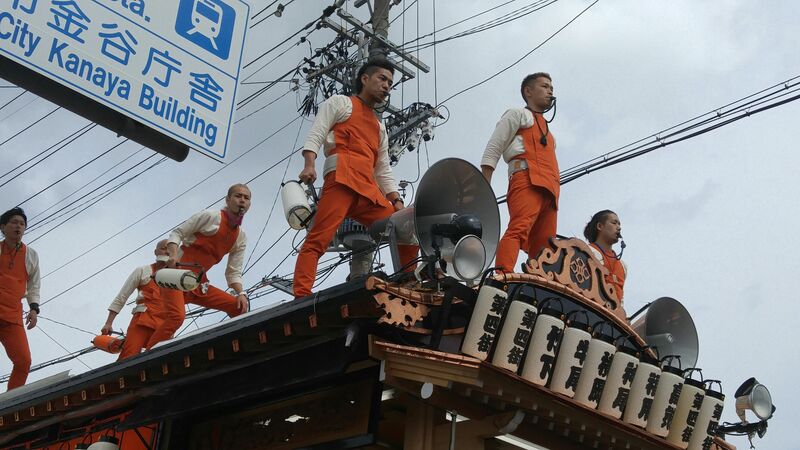 It must have been the most dangerous work of the time! 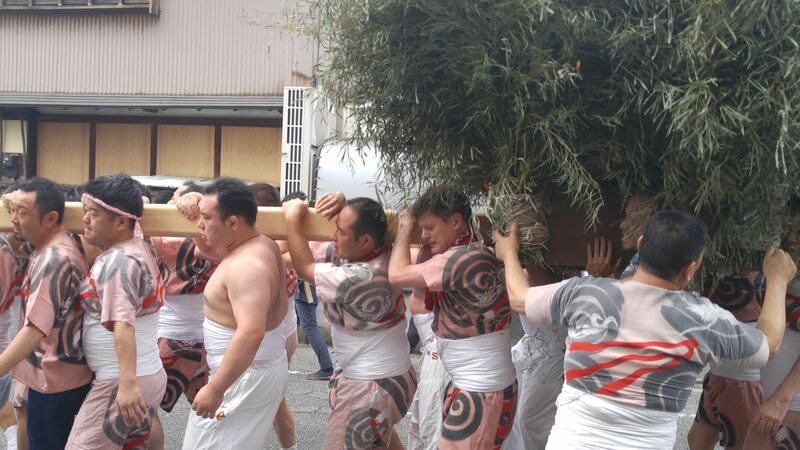 And of course the whole important ladder made of two long green bamboo trunks which are practically impossible to burn! 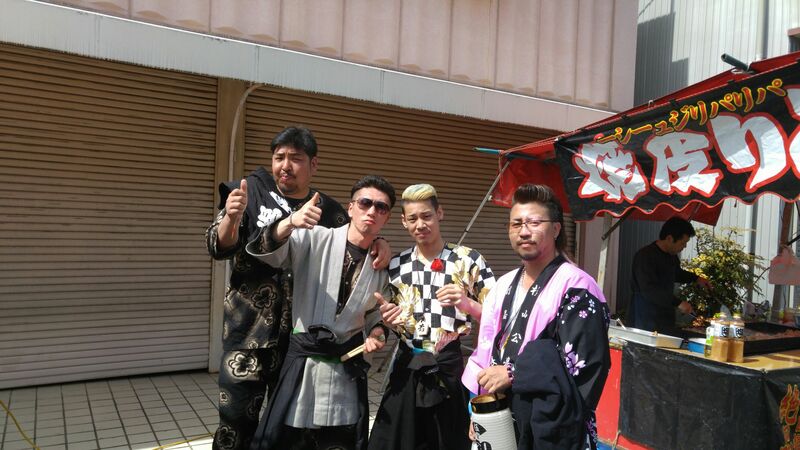 Meet you there again next year! 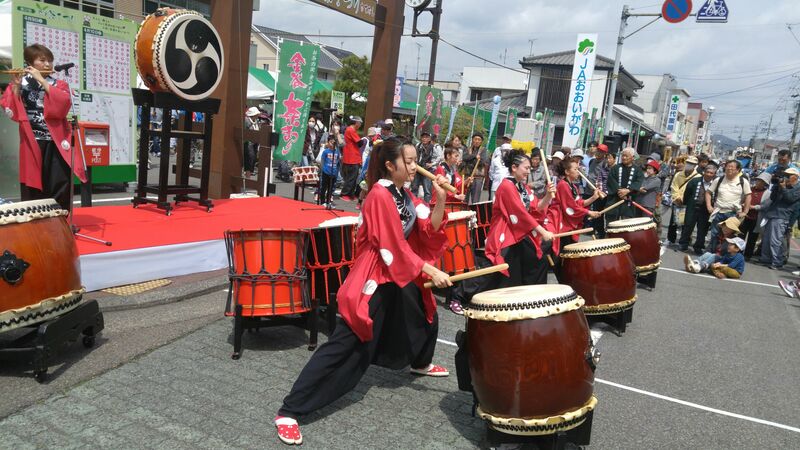 At last, after a two-year interval, I could enjoy the Tea Festival in Kanaya, Shimada City, although my visit was definitely too short to my taste. In 2018, I will definitely stay there at least a full day and a full night! This year I almost reached Kanaya too early, but it gave me time to appreciate that the city and its inhabitants are trying their best every two years! 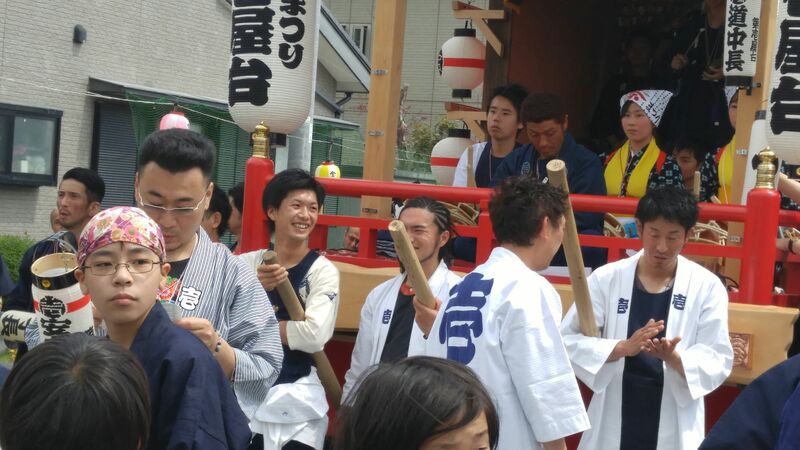 Let me at least introduce their event in pictures! 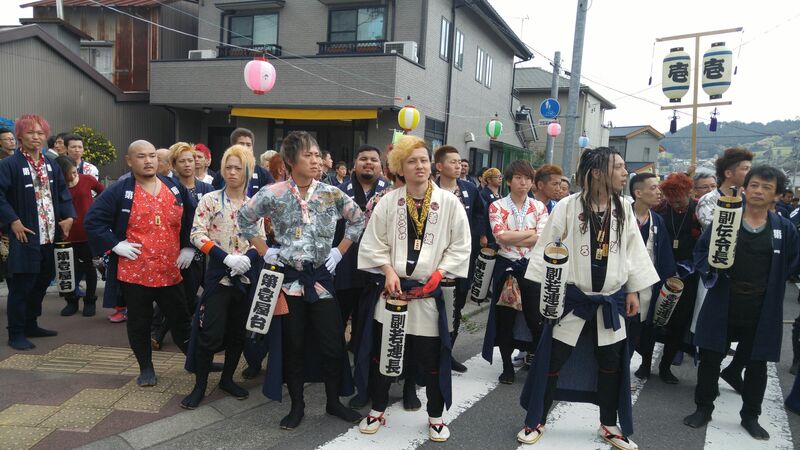 THE GROUPS & THE CLANS! Taking pictures is an embarrassment of choices, especially considering the universal goodwill and fun-loving spirit! The rick is probably to sort your pictures according to themes! 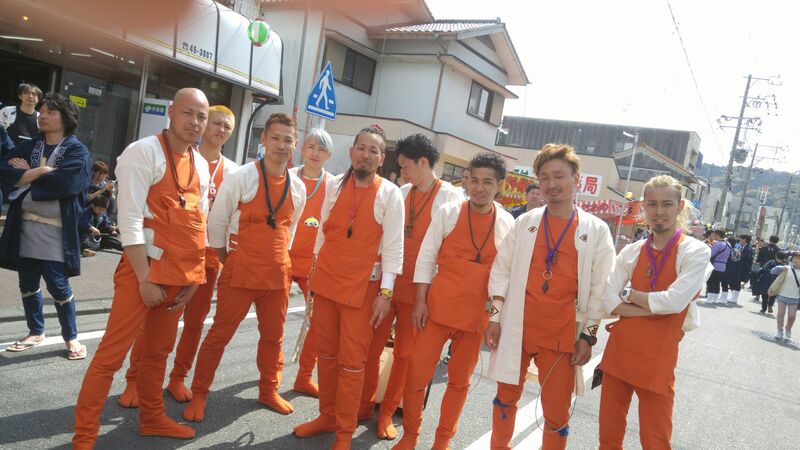 An orange chariot rider team! 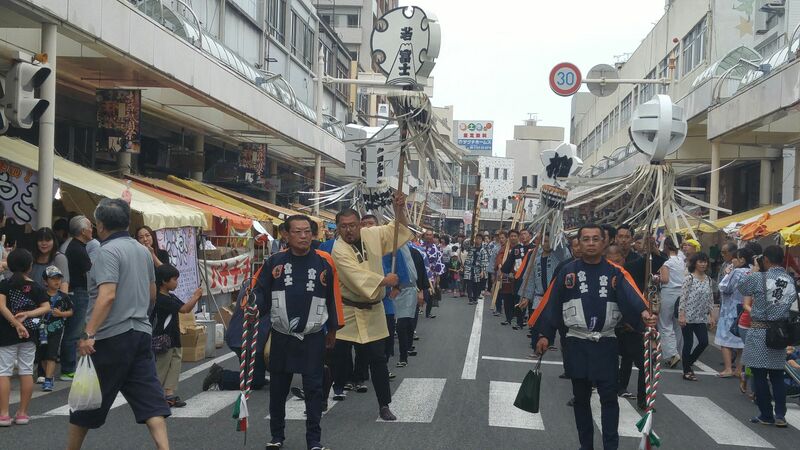 The city is basically divided into 6 traditional precincts dating back to Edo Era and each has its own festival chariots manned and introduced by teams residing in their respective areas! 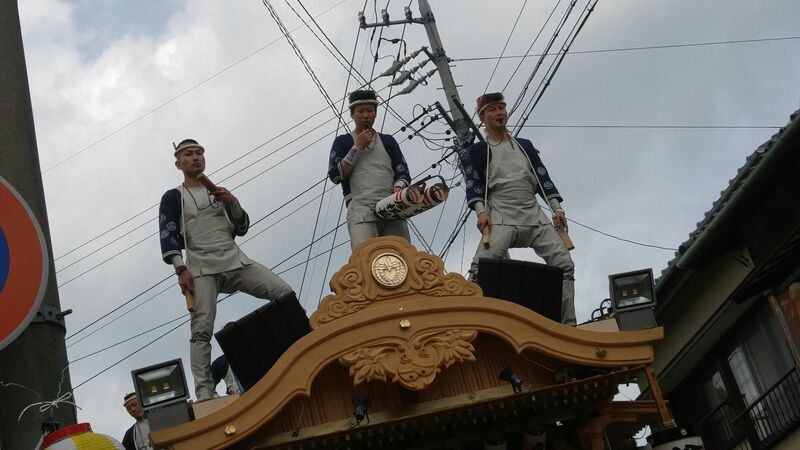 A white and violet chariot rider team! 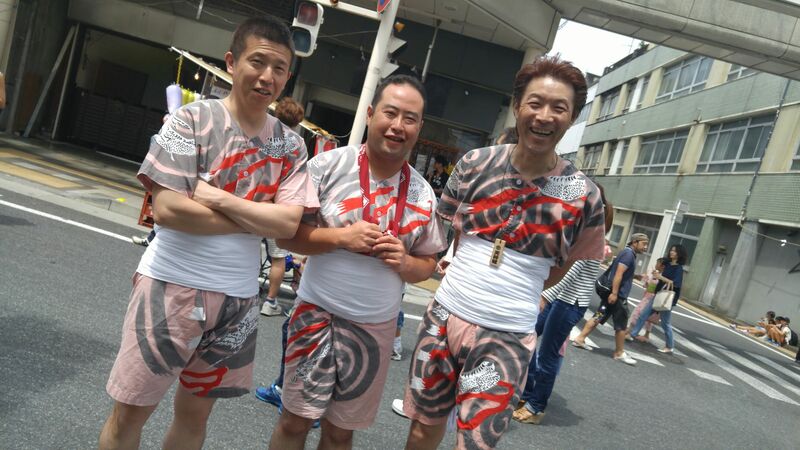 A motley chariot handler team! 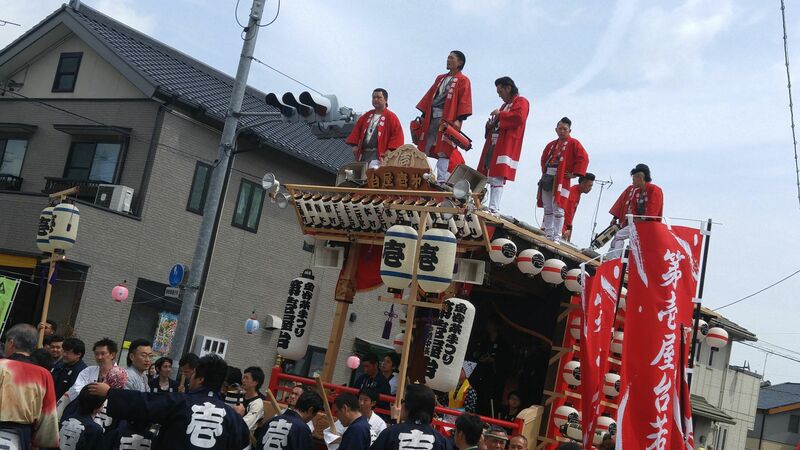 The Chariots, called “Yatai”, is the main event and performed twice, once at noon and another time after dark! 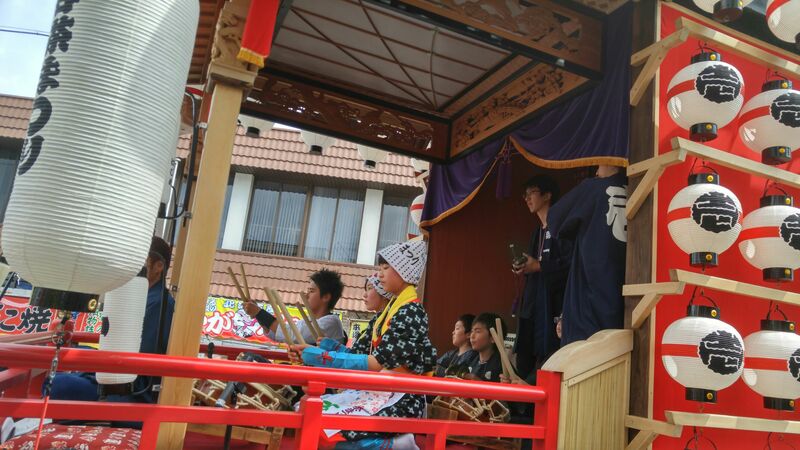 Each chariot carried its own drummers and flutists encouraging the handlers and riders! 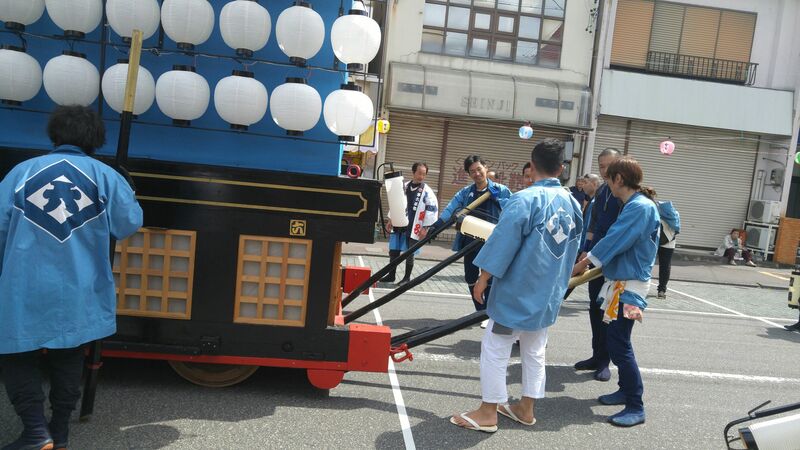 Each chariot was ridden by comparatively light men whose role was toe encourage the handlers! 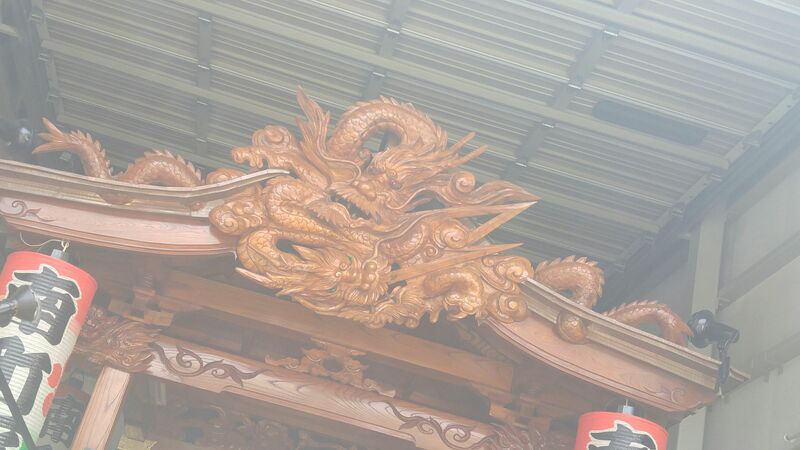 Naturally the same vocal and whistling encouragements amplified when two chariots got near to each other! 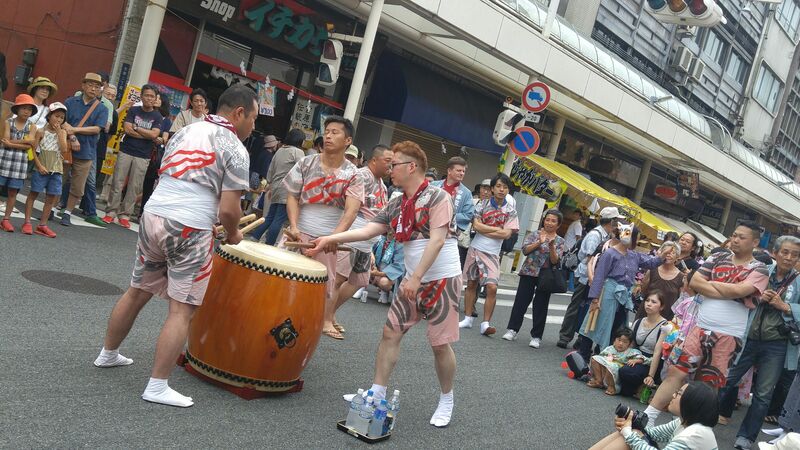 And all the while the drummers keep drumming, drumming and drumming! 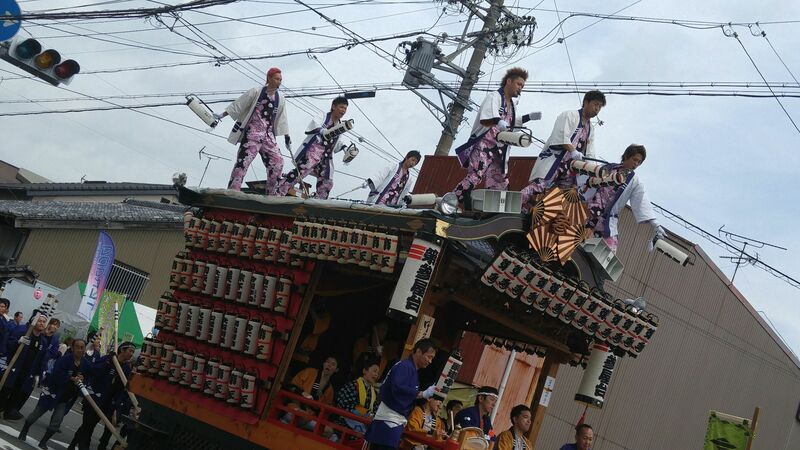 All chariots seem to barely be able to pass under the telephone cables! 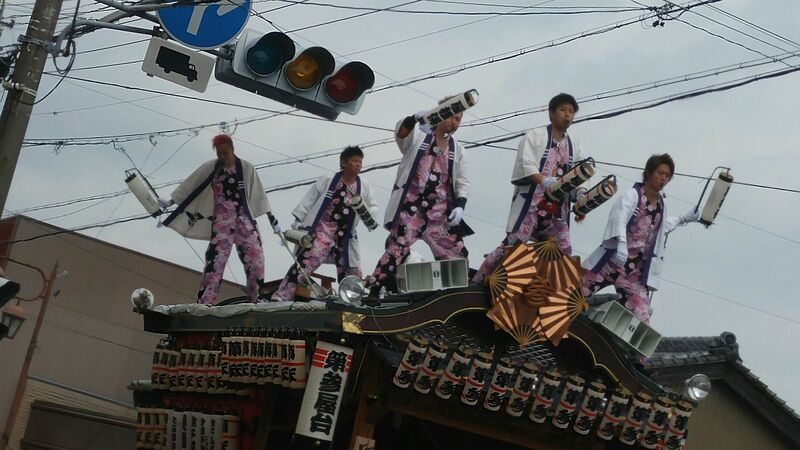 Actually they had more trouble avoiding the traffic lights than each other! Handlers kept smiling all the time! 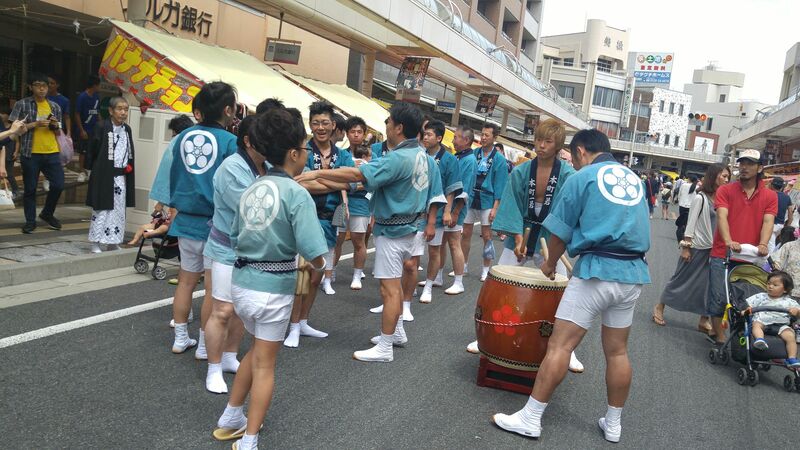 For all their fierce faces, fights are extremely rare between handlers of different chariots. Even when it happens especially at night when everyone tends to imbibe as well, older organizers are very quick to handle any troublemakers without the help of policemen who are practically unseen! There was still a long day to come and participants were obviously saving some energy! 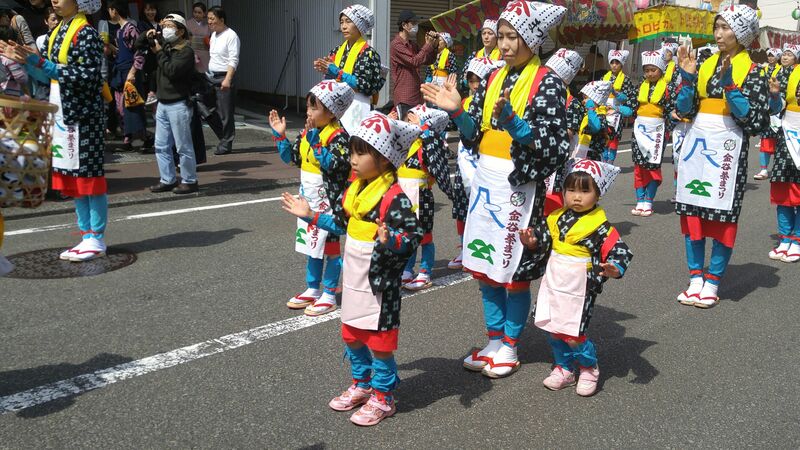 Actually most were looking forward to the night when their hand lanterns would be lit! 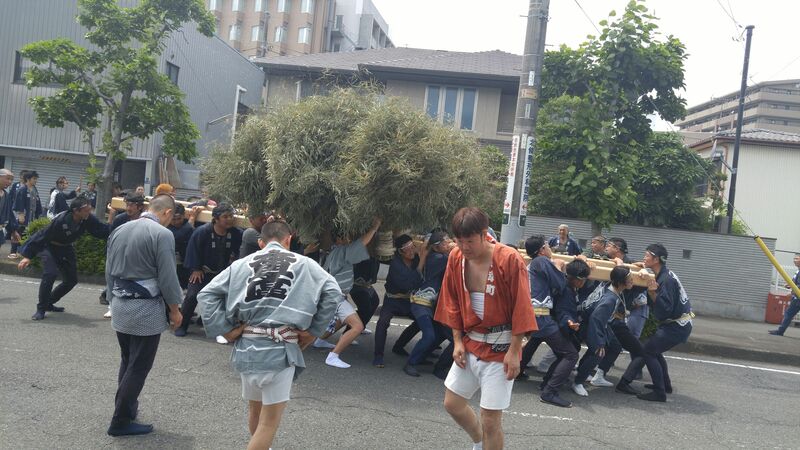 The wheels are actually heavy wood logs that turn slowly and handlers need to push the chariots forward or sideways with long poles while more handlers were pulling the vehicles with heavy ropes! All participants have two years to prepare themselves and some @faces@ are really worth photographing! I actually know the gentleman above who is a truck driver! 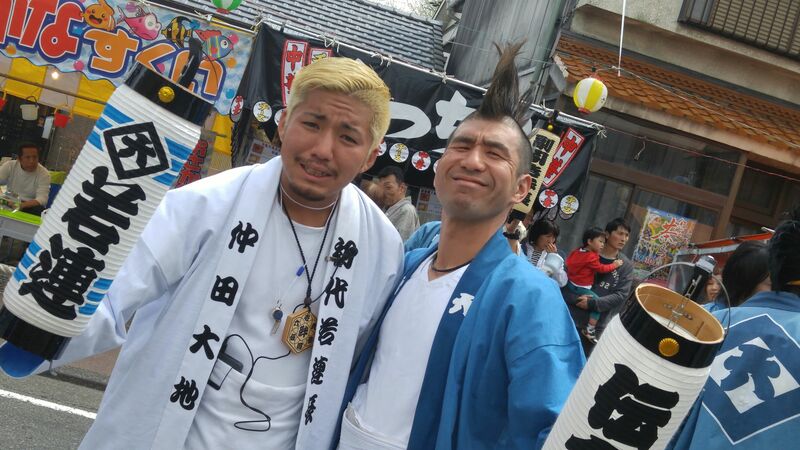 These two are actually senior cadres in the festival! 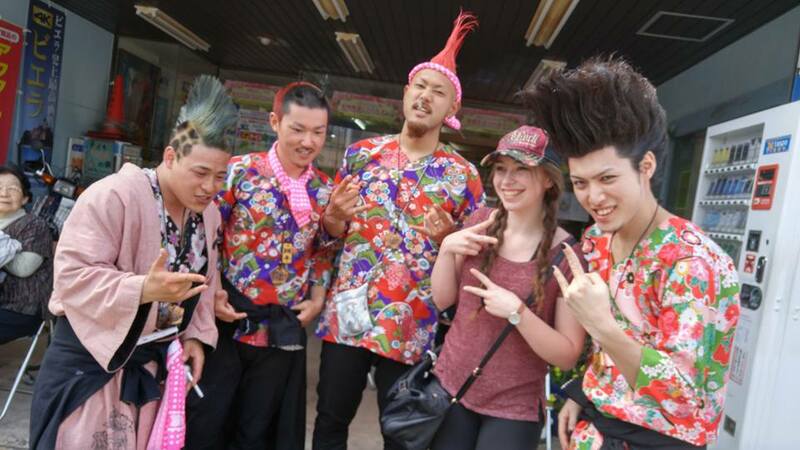 Always extremely happy to pose, especially with cute foreign ladies! The beauties and the beasts? 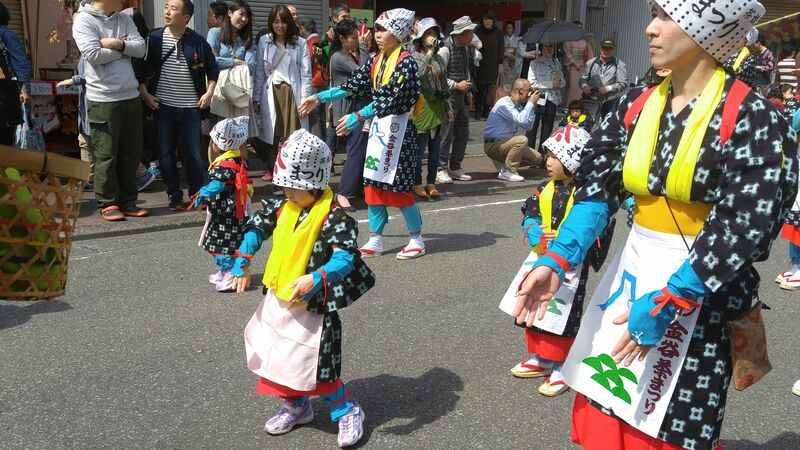 But the Kanaya Tea Festival is known all over Japan for all the ladies of whatever age parading as the “Cha Musume/Tea Ladies”! All the members of the so-called “weak gender” are local! 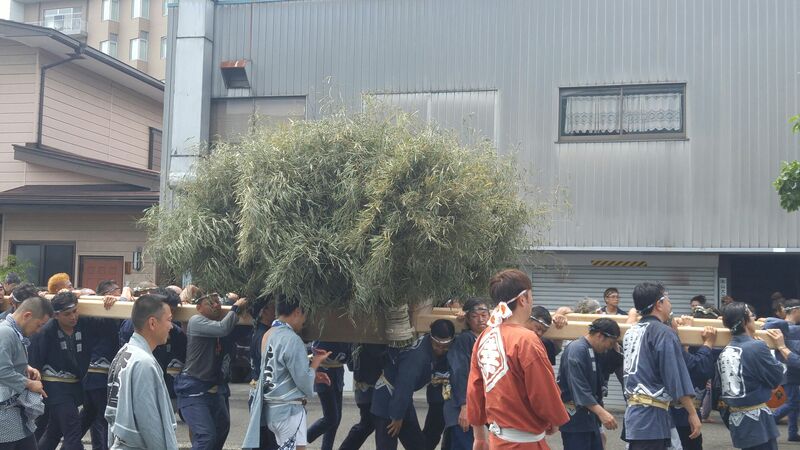 Some of them are even carried along! No less than a thousand of them! See you again in 2018, but at night!